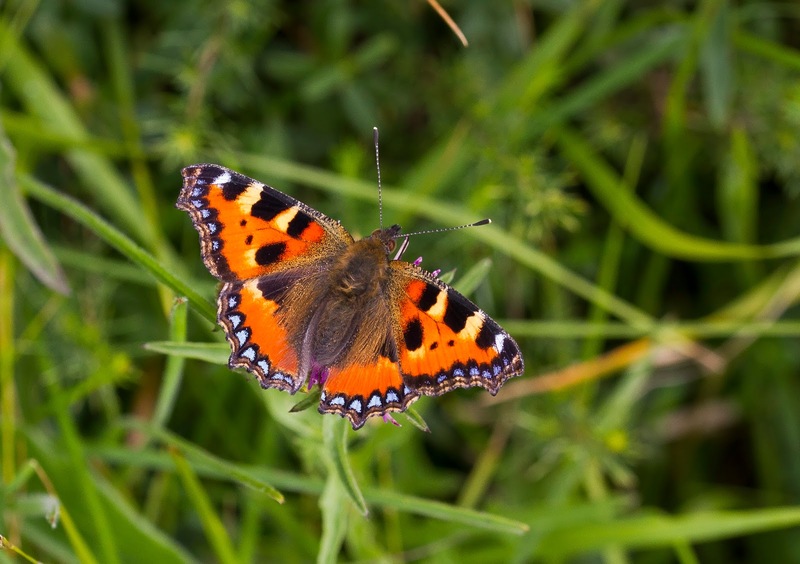 Weather wise 2017 proved to be a mixed bag and started with a nice spring which caused many butterflies to emerge early, in fact some of the spring butterfly species emerged two weeks earlier than they had the year before. 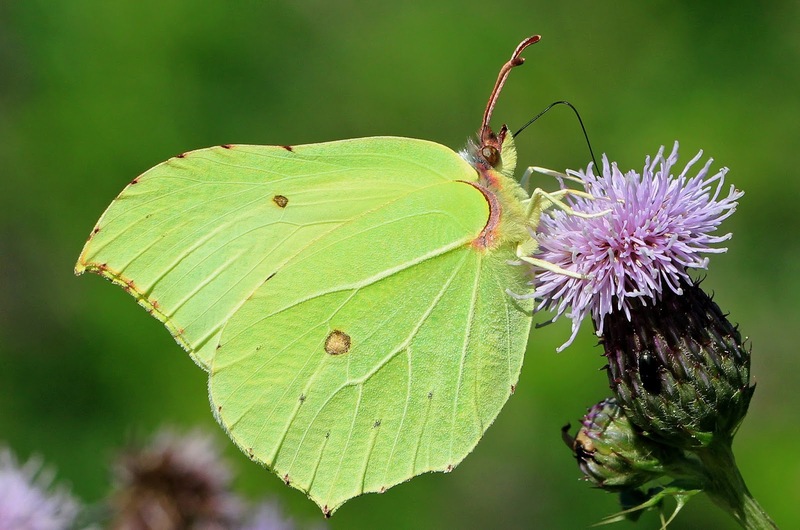 Unfortunately despite the year being one of the warmest on record the weather took a serious turn for the worst during late June when high winds hit the county and then unsettled conditions dominated as the storms battering the USA made their way across the Atlantic to us. Despite this rough weather during the summer the Northamptonshire butterfly season went fairly well for our butterflies and with the exception of the Purple Emperor all key species showed an increase from 2016. 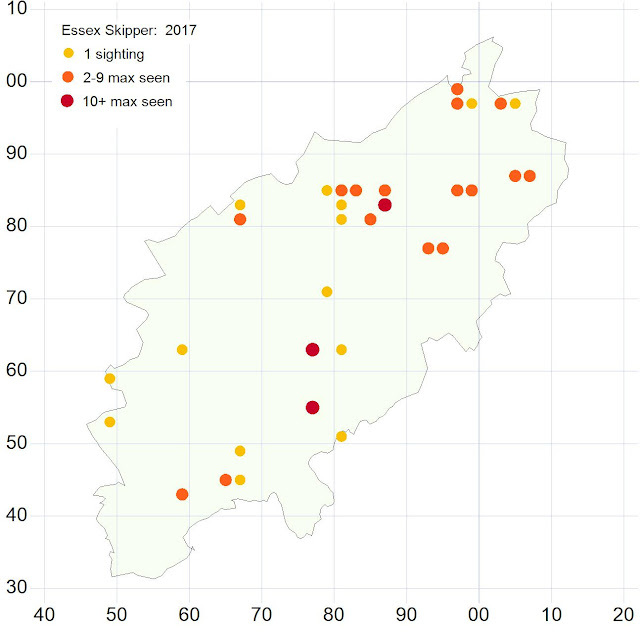 As always a huge thank you needs to go to all our recorders out there as without their valuable contribution none of these species analysis could take place. 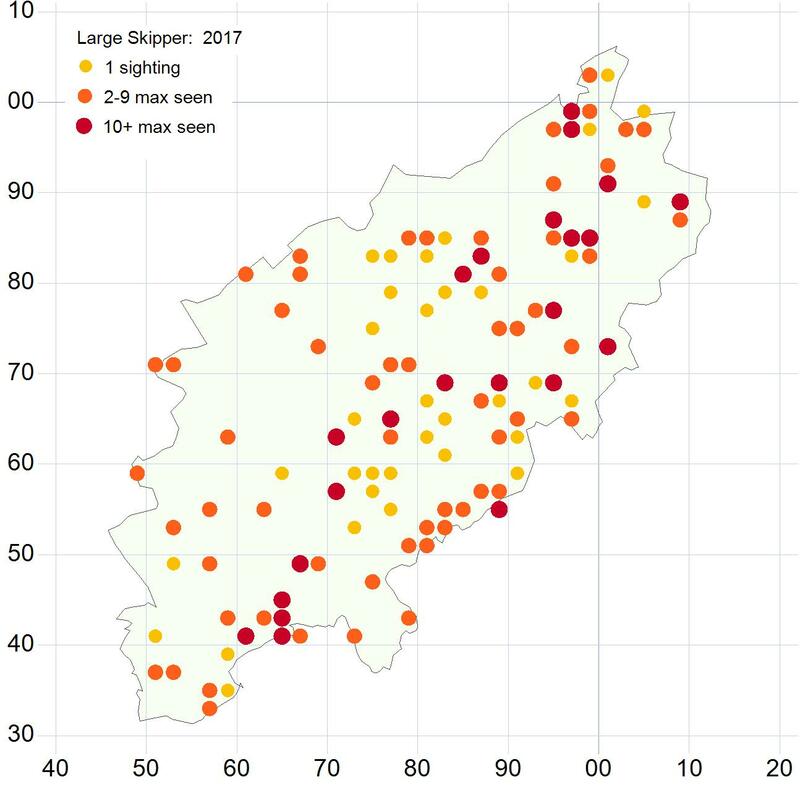 In all we received just over 16,000 records during 2017 which amounts to approximately 56,000 individual butterflies added to our database. As well as the the supply of casual records, UKBMS, WCBS, Garden Butterfly Survey and Big Butterfly Count records the use of iRecord to record butterflies has been a fantastic success. The iRecord website makes data entry easy for our people doing the counts and also (most importantly for me) makes the verification and importing data into our recording software process very easy too so it's certainly worth having a look at if you're not using it already. If you do decide to take up iRecord please still email me your records as you're seeing them so I can update the sightings page of the website but state clearly that you've added them to it so I don't add them to our system too and we get repetition in the records later in the year. As for 2018 it's an exciting time for Northants with two big national projects taking place within the county. 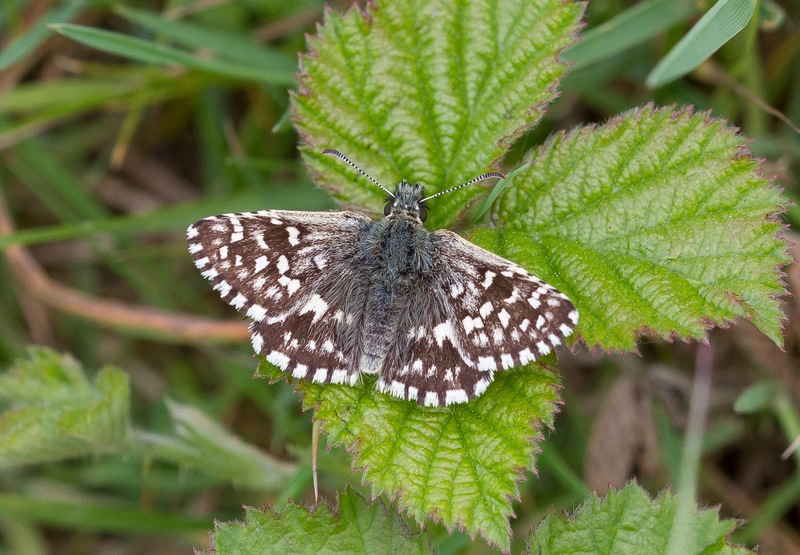 The Woodland Wings project has started with the aim of conserving the Wood White and Black Hairstreak populations in Yardley Chase, Salcey Forest, Bucknell Wood and Hazelborough and of course the Back From The Brink Project looking to reintroduce the Chequered Skipper back into our woodlands in the Rockingham Forest area. The uptake in recording is very encouraging as none of the below could happen if it wasn't for your help. 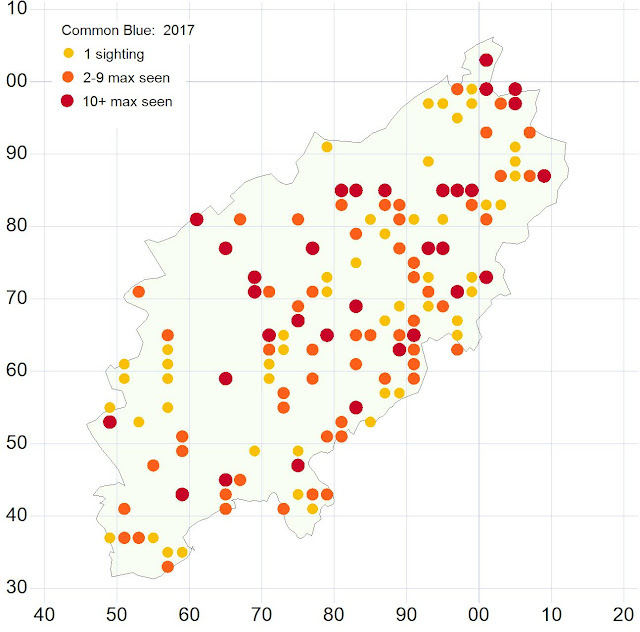 It's also superb to see the amount of people willing to record the commoner butterflies too as well as the scarce as quite often it's the Whites, Peacocks, Red Admirals and Small Tortoiseshells etc. 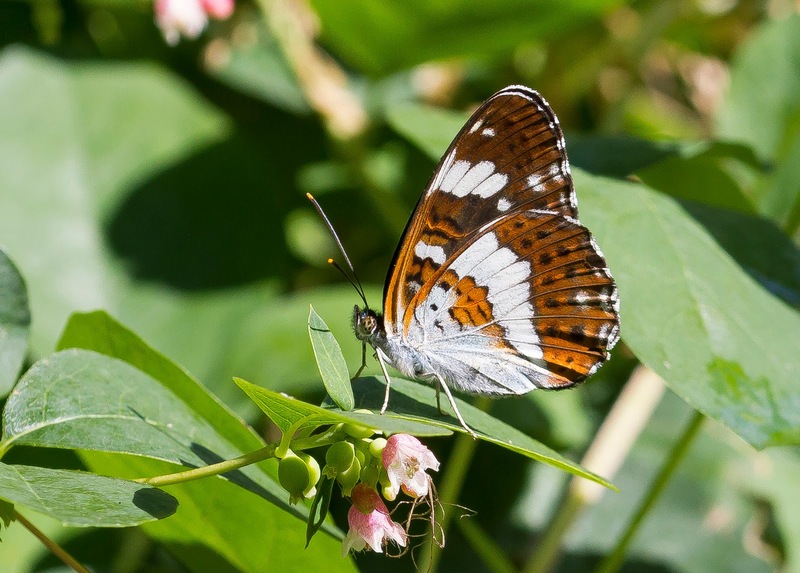 that tell the true story about how well our butterflies are doing. 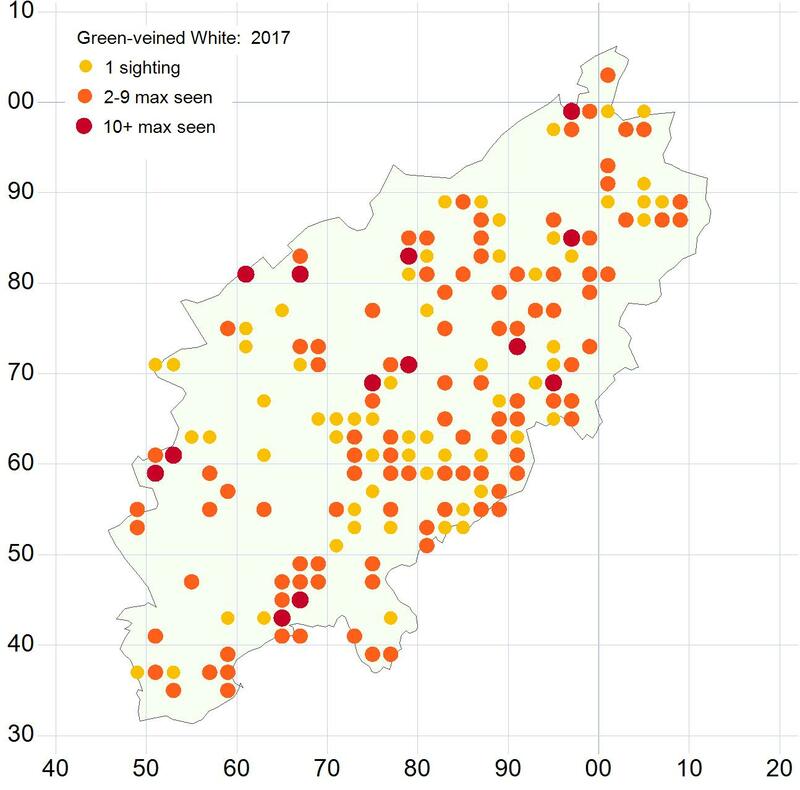 We're all guilty of overlooking species when they're considered common and even seasoned butterfly recorders often let Whites etc. go when they shoot past and they go unidentifiable unless a chase is ensued. 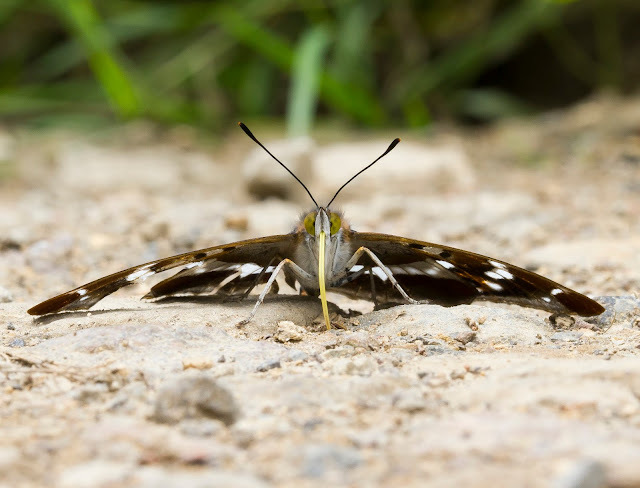 It is worth trying to record as many of the commoner species as possible though, even the ones in your garden, so we can build the best picture we can of the county's butterflies. 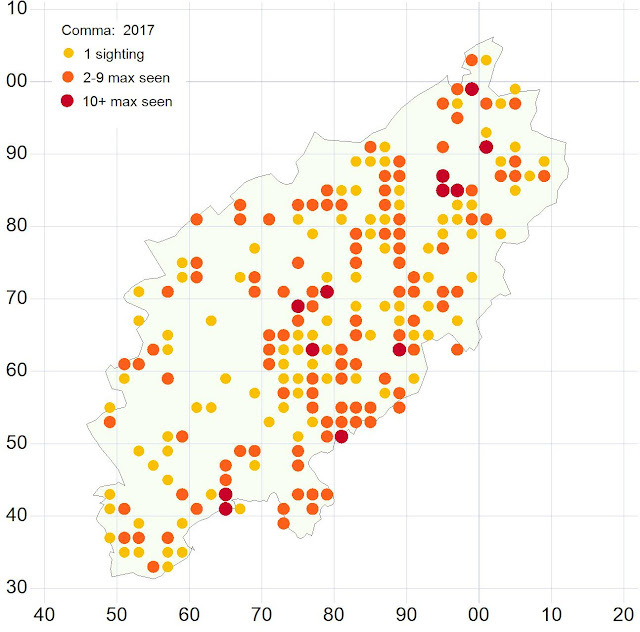 All below text and photos are mine and the distribution maps are copyrighted to Beds and Northants Branch of Butterfly Conservation. 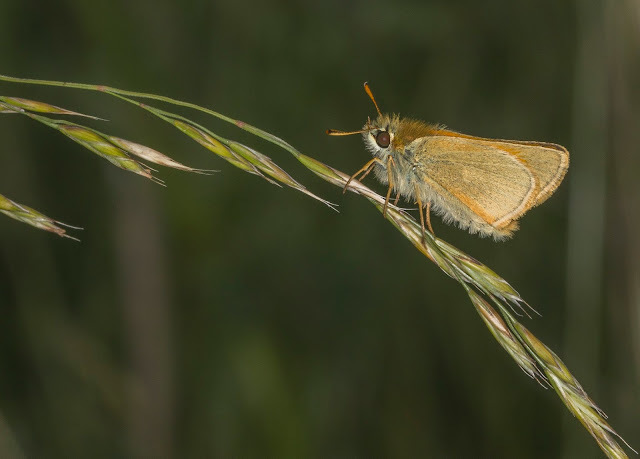 Small Skippers had a good year but the often under recorded Essex Skipper had an incredible year. 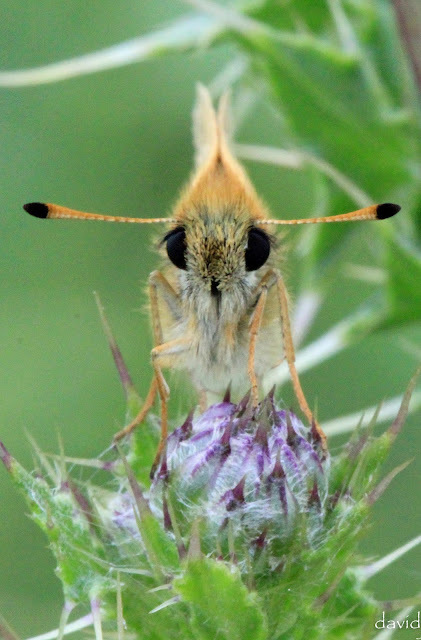 Numbers of both species were well up on previous years with peak counts of 334 Small Skippers and 600+ Essex Skippers at Bradlaugh Fields on the 1st of July. 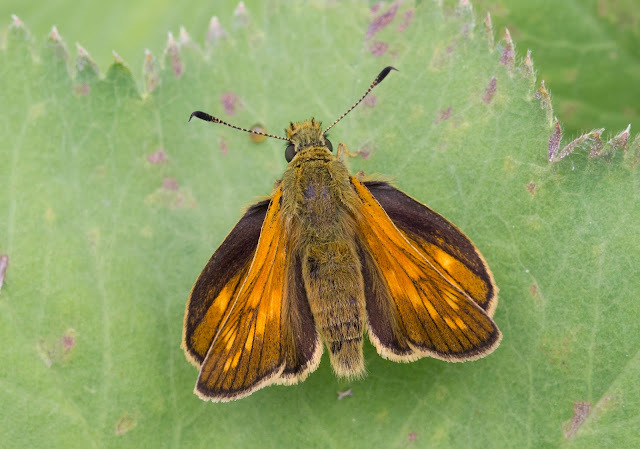 I survey a private grassland site for butterflies just outside Northampton and during these surveys I was amazed at how many Essex Skippers there were and it seemed every Ragwort head had several Essex and Small Skippers busy nectaring on it. Compared to previous years the numbers of Large Skipper remained about the same with a slight 6.9% increase and a good spread of records around the county.. The first one was reported on the 25th May in Duston and the last was seen on the 16th August near Southwick Wood. The highest counts came from Bucknell Wood on the 19th June and the 2nd of July and also Fermyn Wood on the 1st of July. The Dingy Skipper had a 13% increase from last year and the principle sites for the species were Twywell Hills and Dales, Fermyn Country Park, Old Sulehey and Great Morton Sale. The firsts and lasts of the year were both seen at Twywell Hills and Dales with the first seen on the 23rd April and the last on the 20th June. 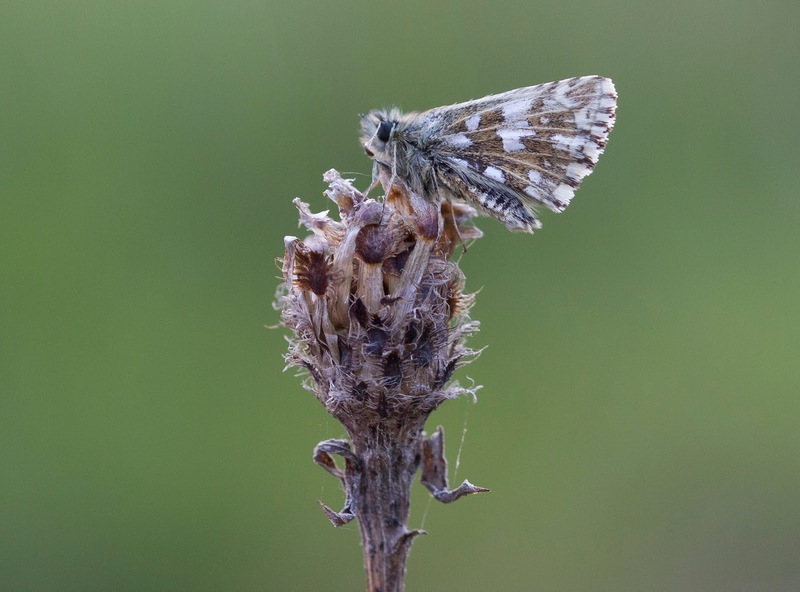 As with the other grassland species such as the Grizzled Skipper this species relies upon well maintained habitats which is why we put so much time and effort during our winter work parties into creating the right habitats for them. The Grizzled Skipper had a good year with a fantastic 109% increase from 2016. 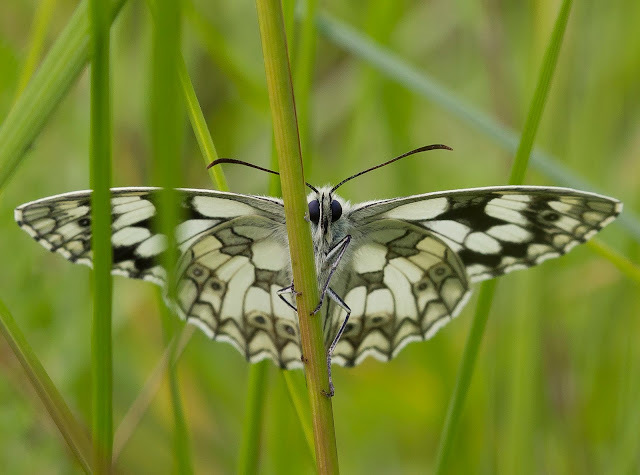 The first record was seen on the 23rd April at Twywell Hills and Dales by Andy Wyldes and the last record was a remarkably late date suggesting a second emergence at Ring Haw on the 9th of July also seen by Andy Wyldes. Almost certainly the best site for the species in the county is Twywell Hills and Dales but other good sites to see them are Fermyn Country Park, Polebrook Airfield and Great Morton Sale. 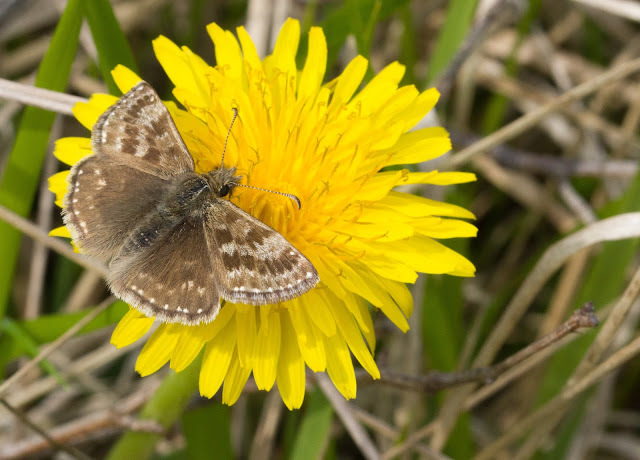 As mentioned above in the Dingy Skipper account a great deal of work is being done to conserve these species in the county and it is encouraged if you have the time to join us on our winter work parties to help provide the necessary habitats for them to thrive. 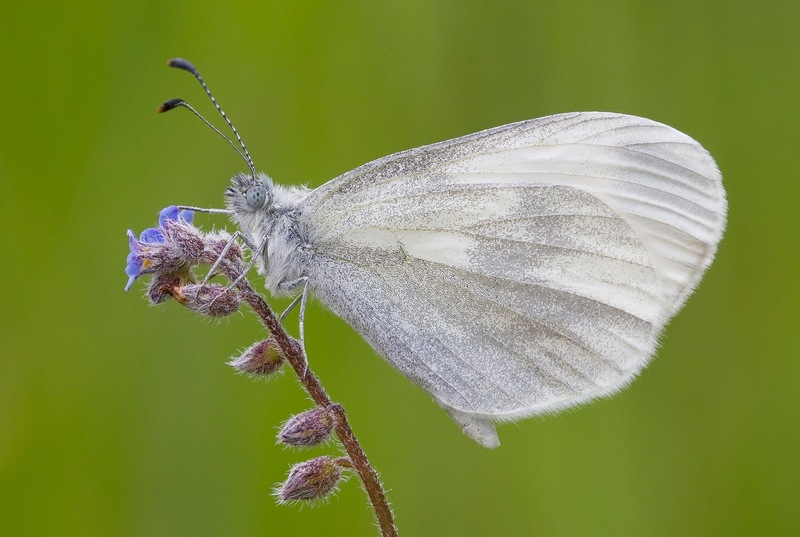 The Wood White populations remained about the same from last year with a minor 3% increase countywide. Despite numbers being good in the strongholds of Bucknell Wood, Hazelborough Forest, Sywell Wood and Yardley Chase (please note that although the Forestry Commission still gives access to a few to carry out ecology surveys Sywell Wood and Yardley Chase are private with no access to the public) they were down significantly in Salcey Forest and although numbers are still fairly good at the site action needs to be taken to reduce the possibility of a downward spiral. 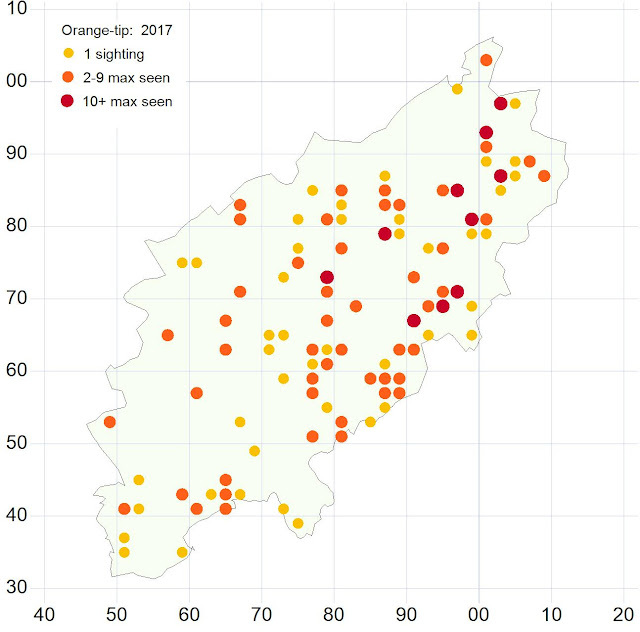 The Woodland Wings project which has started this year will address this issue in Salcey with a partnership with the Forestry Commission to develop a management plan to widen the rather overgrown rides to help this species to increase in numbers. The first Wood White was recorded in Hazelborough Forest on the 7th May and this typically long flying species continued into 2nd broods at a number of sites with the last of the year being seen on the 28th of August in Bucknell Wood which is incidentally the latest one we have in our records. 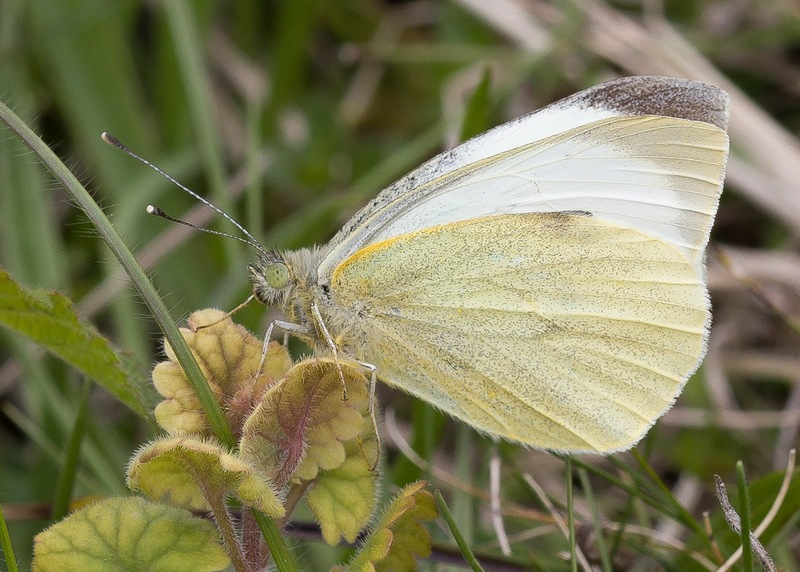 Interestingly this species is known to stray quite far from it's normal areas and this year was no different when a surprising record came from the western end of Summer Leys Nature Reserve with a single Wood White nectaring on the flowers in a patch of meadow! 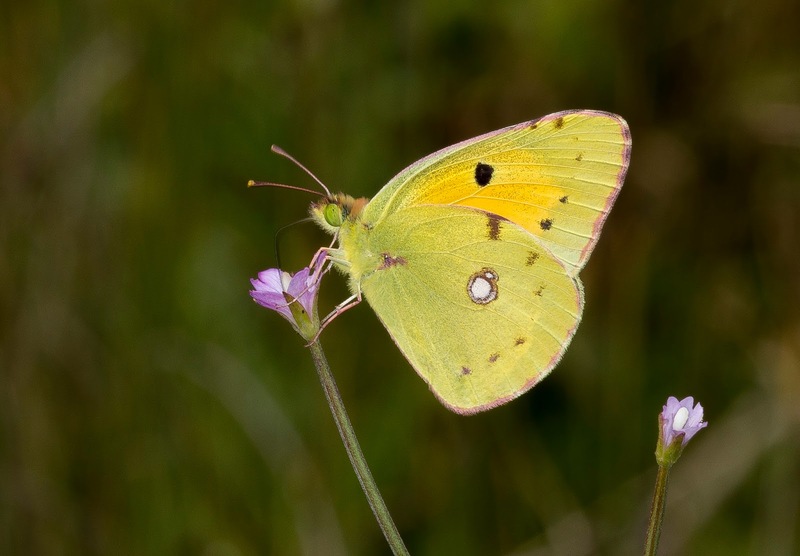 The Clouded Yellow was seen in a handful of locations in Northants during 2017 and with the exception of one seen at Stanwick Lakes on the 6th of August, another seen at Twywell Hills and Dales on the 10th of August and another at Titchmarsh Nature Reserve on the 26th of August all the others were in the north east of the county between Corby and the border with Cambridgeshire. The first one was reported on the 13th of July at Glendon and the last was seen on the 28th of August at Priors Hall with the records in between amounting to a 128% increase from last year (although that shouldn't be taken to mean too much as not many were seen in 2016). Brimstone records show a 25% increase but this figure maybe skewed slightly due to the fantastic increase in records received by people last year compared to the year before. Either way it seems that for certainly the time being the species is doing well within in the county. The first one was recorded on the 15th of February at Priors Hall Park and the last one was seen along Polwell Lane in Barton Seagrave on the 17th of October. 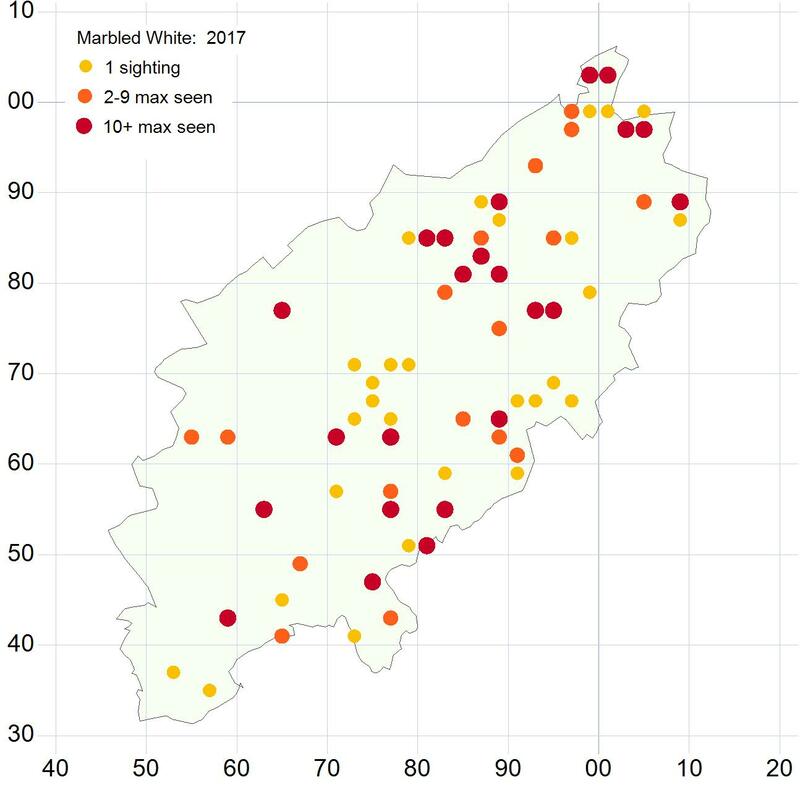 Despite the big increase in records mentioned above it does seem alarming that the common Whites do seem to show a decrease from last year. 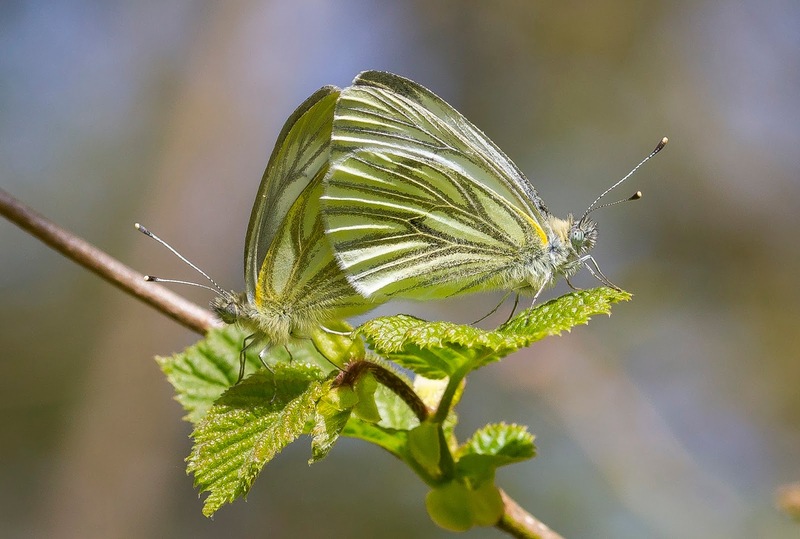 The Large White is down 5%, the Small White is down 4% and the Green-veined White is down 37%. 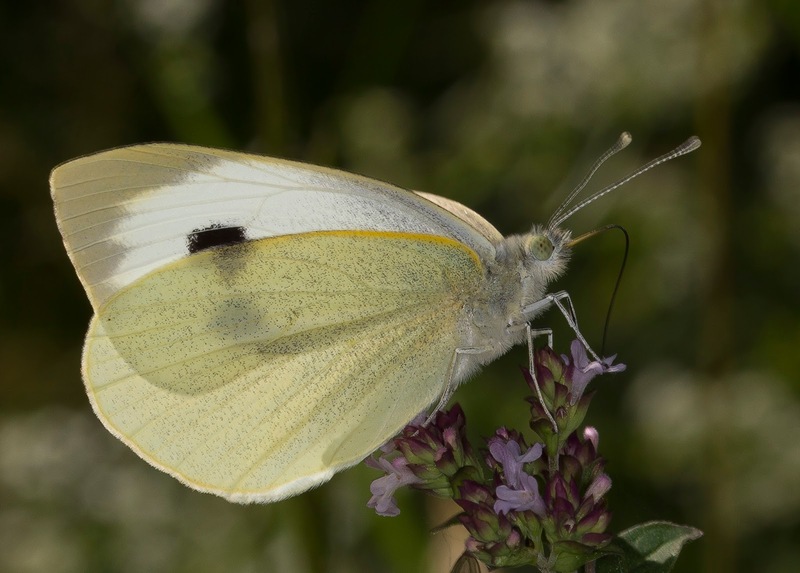 The first Large White was seen on the 30th of March at Polebrook and the last on the 17th of October in Delepre Abbey Gardens, the first Small White was seen on the 13th of March in a Brackley garden and the last was seen on the 17th of October along Polwell Lane in Barton Seagrave, and the first Green-veined White was seen on the 3rd of April in Hazelborough Forest and the last on the 2nd of October in Harlestone Firs. The Orange-tip is one of the most eagerly awaited butterflies of the year as being one that doesn't overwinter as an adult it signifies the first emergence of the season. Orange-tips records were up this year by 36% and were seen all over the county with the highest counts coming from Fermyn Woods, Great Morton Sale, Irthlingborough Lakes and Meadows and Stanwick Lakes. The first was seen on the 30th of March in Hazelborough Forest and the last on the 5th July near Towcester. The Hairstreaks had a good year in Northants during 2017 and although confined to just a handful of sites in the north east of the county the Green Hairstreak was no exception. 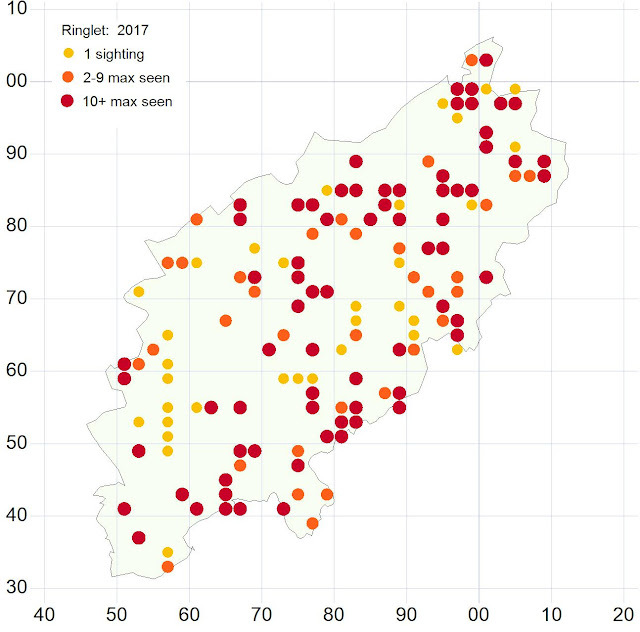 The records show a 79% increase from last year with the best places to see them being Fermyn Country Park, West Lodge near Desborough and Twywell Hills and Dales. The first of the year was recorded on the 23rd of April at Twywell Hills and Dales and the last was seen at the same site on the 22nd of June. 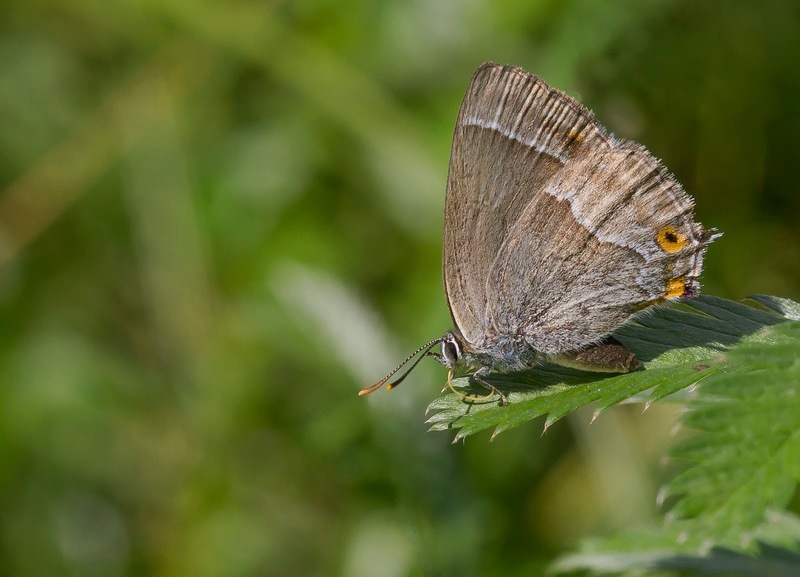 The Purple Hairstreak had a bumper year and the records show a 98% increase from 2016. This was reflected in my own personal observations as during my travels whilst out recording standing next to any oak tree in a suitable location seemed to result in a sighting! The highest count came from Brampton Wood with 65 seen on one day but other sites where they were seen in good numbers were Bucknell Wood, Fermyn Woods, and Salcey Forest. The area know as The Cover at Pitsford Water also had new records for them and I was quite surprised when I was invited to survey a private site near Little Houghton to see them flying around a mature Oak in the middle of a grass field at least a mile or so from the nearest woodland. The first of the year was seen on the 19th of June in Fermyn Wood and the last was reported on the 14th August at Barnwell Country Park. Although the Black Hairstreak shows an 87% increase part of this is due to an unusually large count at a single site. The thicket at Fermyn Country Park is very quickly becoming one of the premier sites for the species in the county and this is due to the hard work put in by the staff and their volunteers in creating such excellent habitat. A peek count this year of 31 Black Hairstreaks is testimony to the effort put in and they should be congratulated for their achievements! The nearby Fermyn and Lady Woods are also showing a spread of the species too and records were received from all over the site during the year. 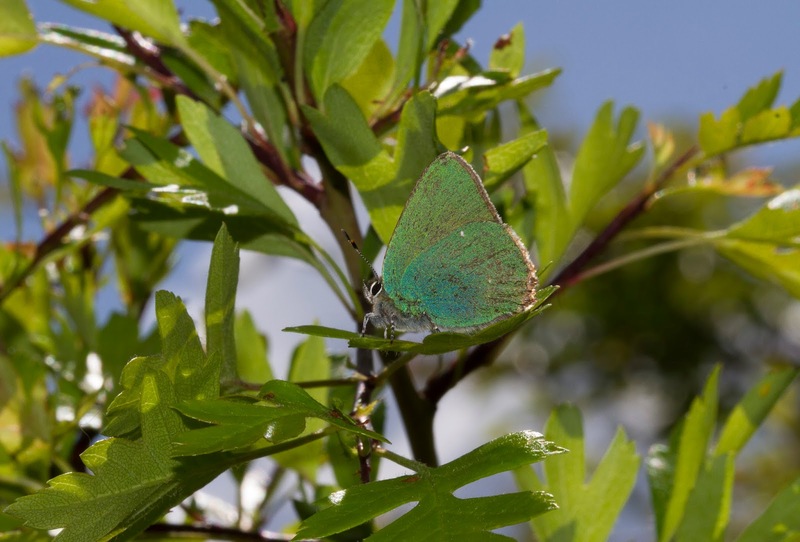 Numbers have increased in Salcey Forest with an increase in records along the ride south of the Horsebox car park and Glapthorn Cow Pastures also didn't disappoint the many people traveling to the county to see them and still remains the best site we have to see Black Hairstreaks up close. The first record of the year was seen on the 3rd of June at Fermyn Country Park and the last was recorded on the 2nd of July in Fermyn Woods. The White-letter Hairstreak shows a 29% increase from last year and despite the ever present threat of Dutch Elm disease destroying old locations they do seem to be appearing in new ones. 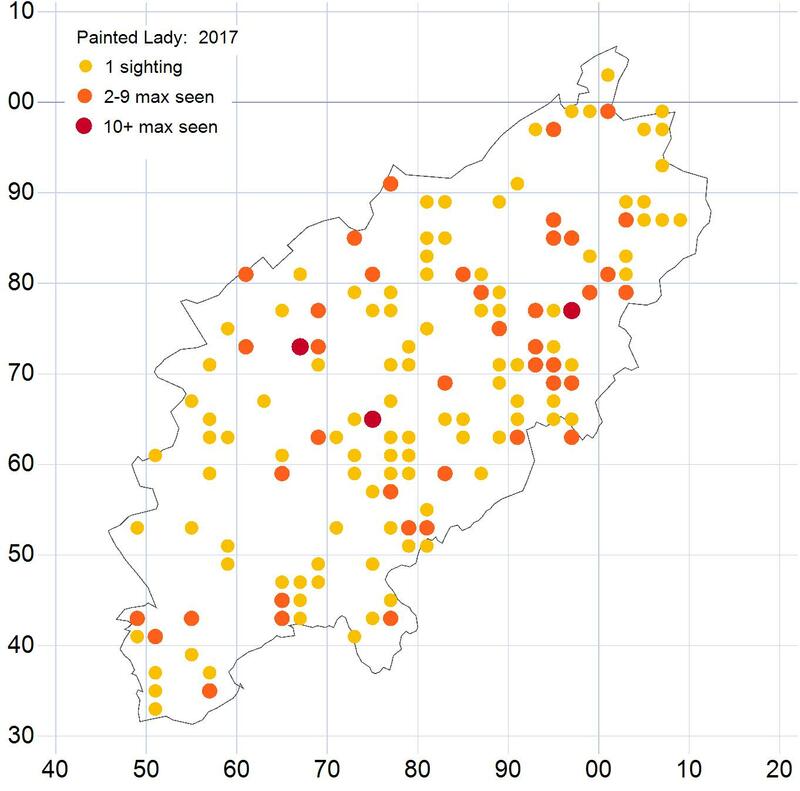 Lady Wood gave the highest numbers this year with 15 recorded down a single ride as well as single figure records around the Elms dotted around here and Fermyn Woods. They were also reported in Bucknell Wood, Finedon Country Park, Fineshade Wood, Little Wood, Wicksteeds Arboretum and Yardley Chase. The first of the year was seen on the 17th of June in Lady Wood and the last was seen on the 30th July in Fineshade Wood. 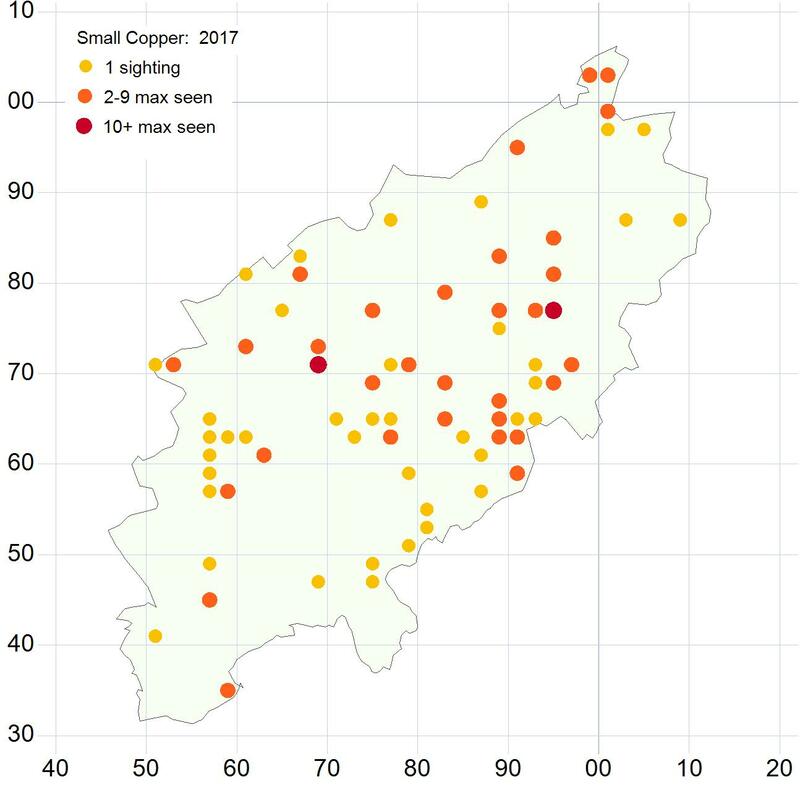 The records for Small Copper show a 139% increase from last year and the total annual count is the best we've had since the 2006. 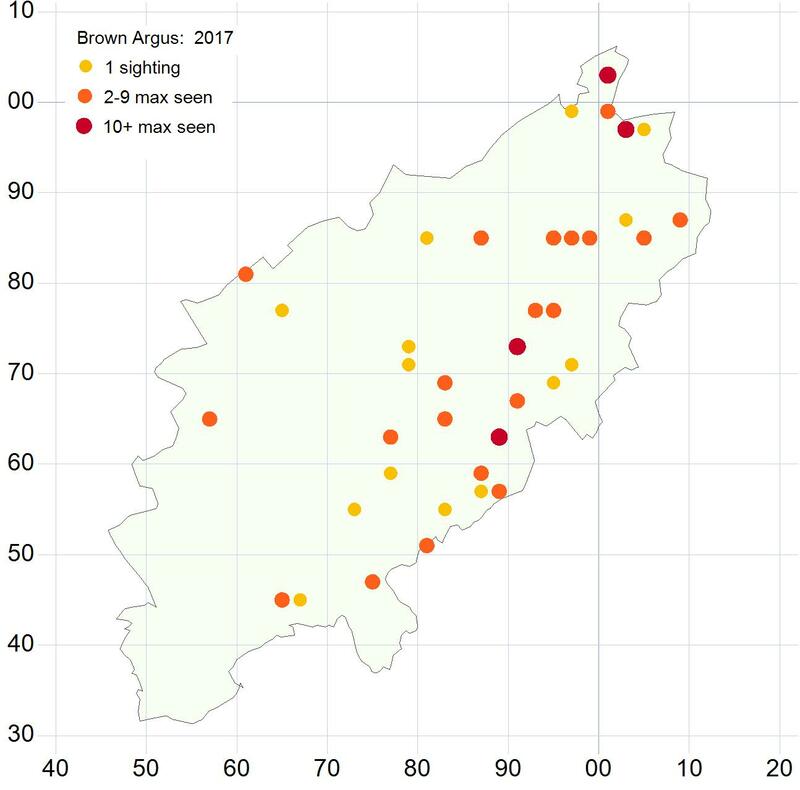 The species had a poor showing in 2016 until the autumn brought a resurgence in numbers so these figures are encouraging to see. 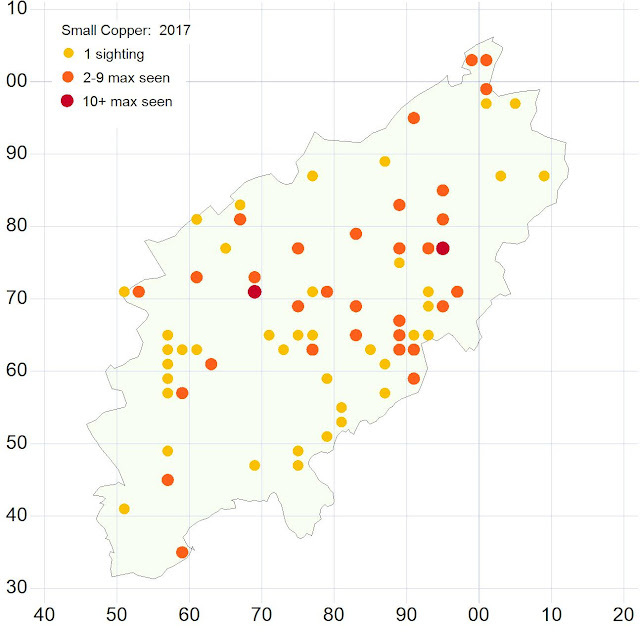 The highest counts for Small Coppers in 2017 were at Bradlaugh Fields, Everdon Hill, Hollowell Reservoir, Pitsford Reservoir, Ravensthorpe Reservoir, Summer Leys and Twywell Hills and Dales. 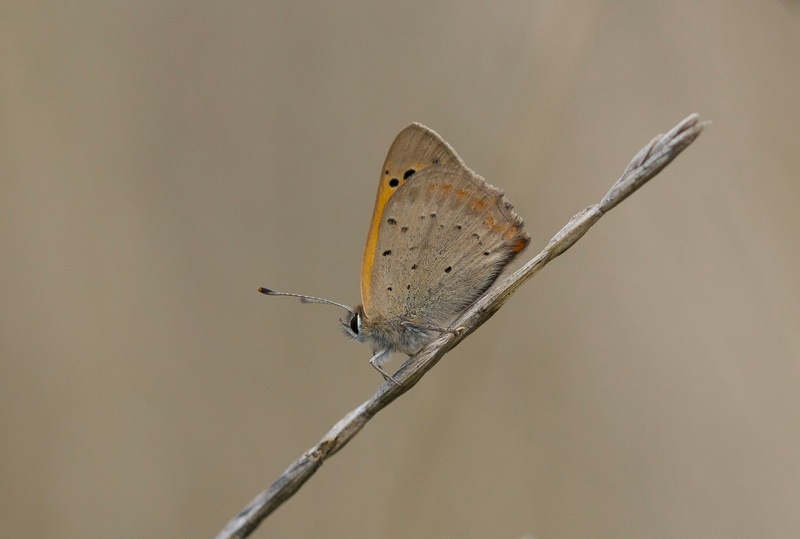 The first record for the year was seen on the 5th of May at Twywell Hills and Dales and the last one was seen on the 29th October at Summer Leys. 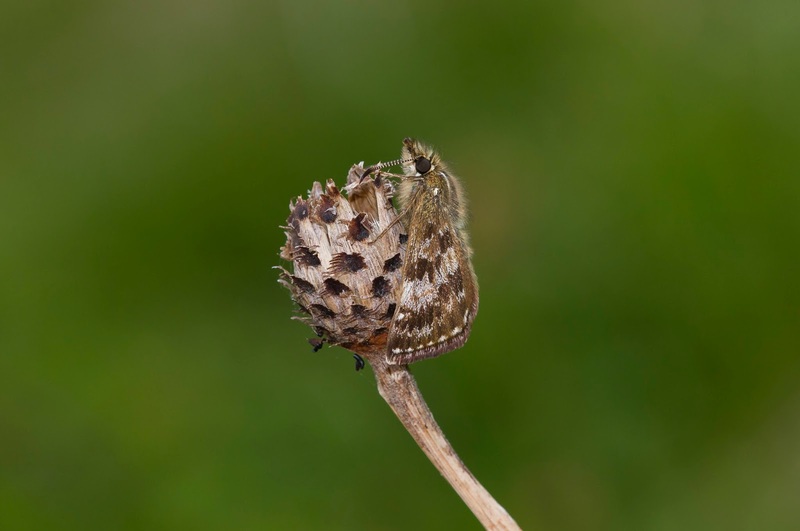 The year also saw some nice aberrations with the ab.radiata seen at a couple of sites. 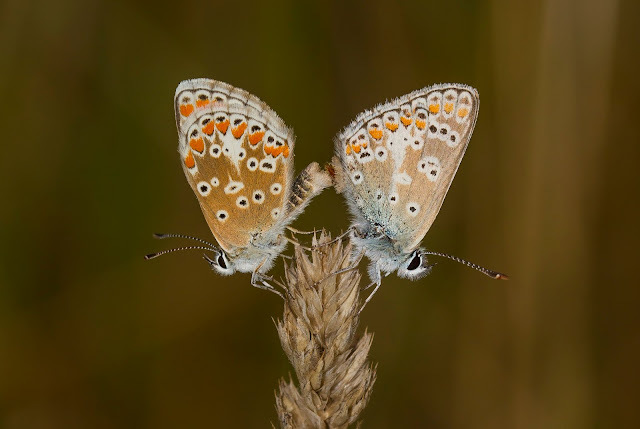 The Brown Argus had a slight increase from last year with a highest count of 24 seen in a single visit to Collyweston Deeps on the 6th of August. Other sites with not quite as large counts as this include Finedon Pocket Park, Great Morton Sale, Summer Leys and Twywell Hills and Dales. They do have a good spread around the county though and can be encountered anywhere where there is suitable habitat. The first Brown Argus of the year was seen on the 10th of May at Twywell Hills and Dales and the same site also saw the last one on the 12th of September. 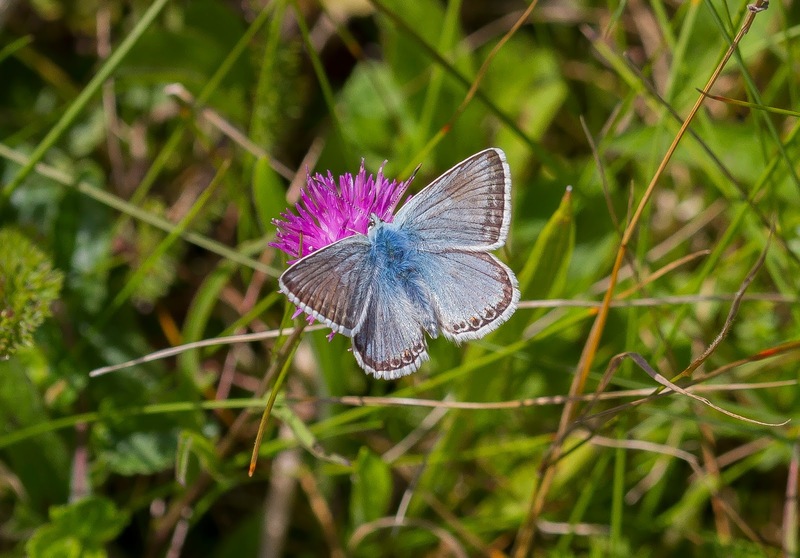 The Common Blue had a good year with a 63% increase from 2016. 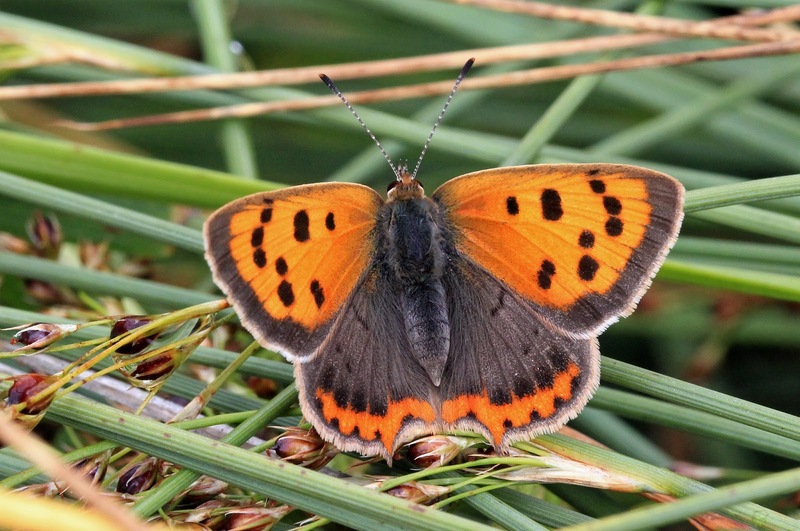 The first one was seen on the 5th of May at Twywell Hills and Dales and the last was seen on the very late date of the 11th of October at Summer Leys. 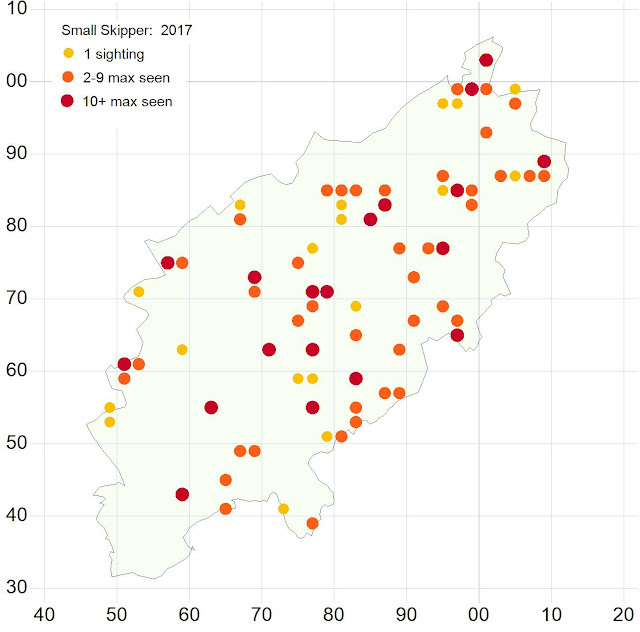 The best sites with the highest counts for the species were Boddington Reservoir, Draughton Airfield, Fermyn and Lady Wood, Helmdon Old Station Yard, Hollowell Reservoir, Lyvedon New Bield, Polebrook Airfield, Stanford Reservoir, Summer Leys and Welford Quarry. 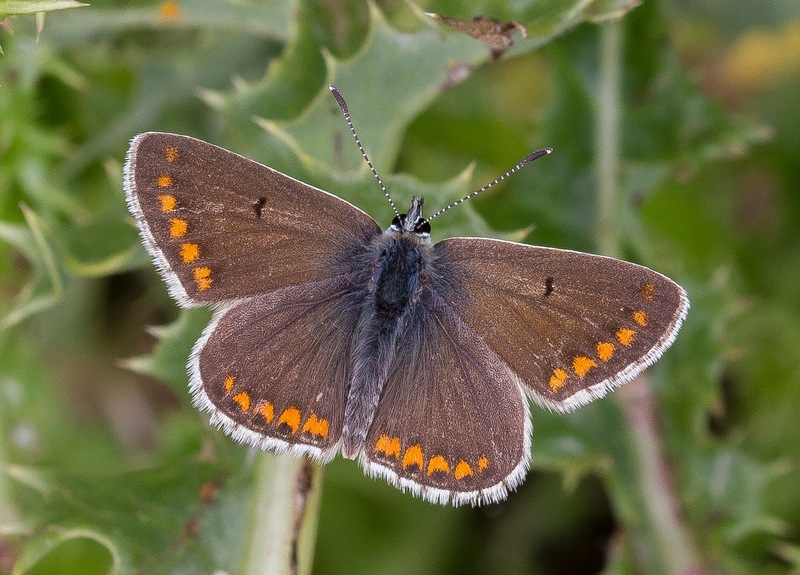 As with the Brown Argus though any suitable grassland habitat would no doubt produce a sighting. The Chalkhill Blue took a rather unexpected jump in records when a large colony was found at Spanhoe Airfield near Wakerley Wood. 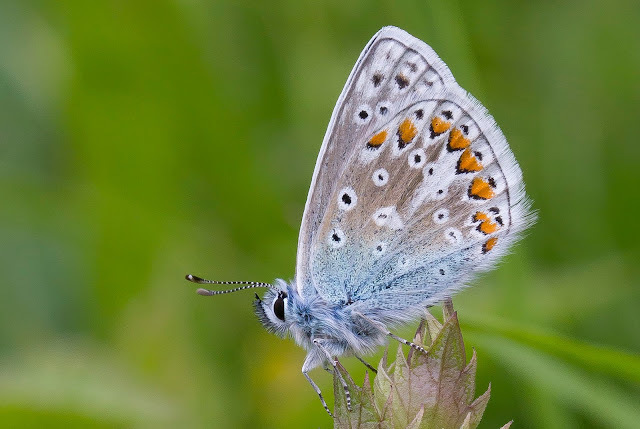 Unfortunately the colony was found during a last minute rare plant salvage mission as the site was under the advanced planning stages to turn it into a quarry which sadly happened a few weeks after the Chalkhill Blue flight time. The peak count at this site was 300+ so it's a real shame to have this colony destroyed so soon after being discovered. 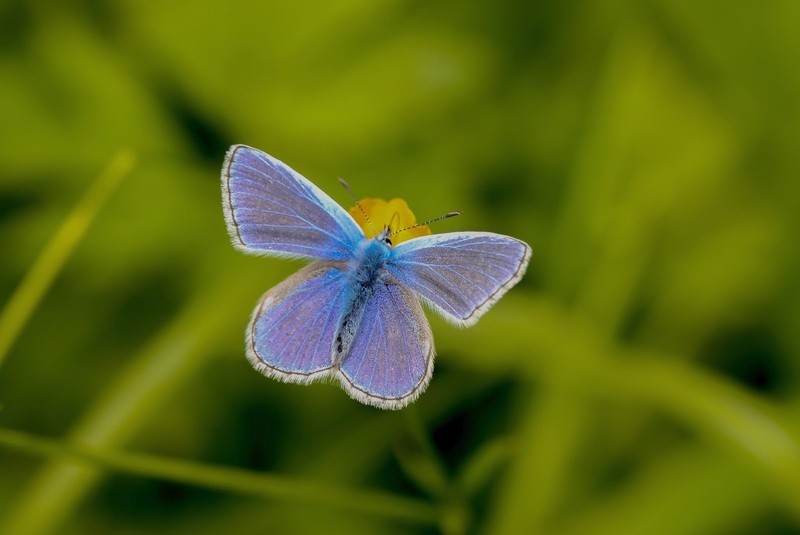 A few Chalkhill Blues were seen at a couple of different sites with 1 seen at Collweston Deeps on the 30th of July and 3 seen near Southwick on the 16th of August. 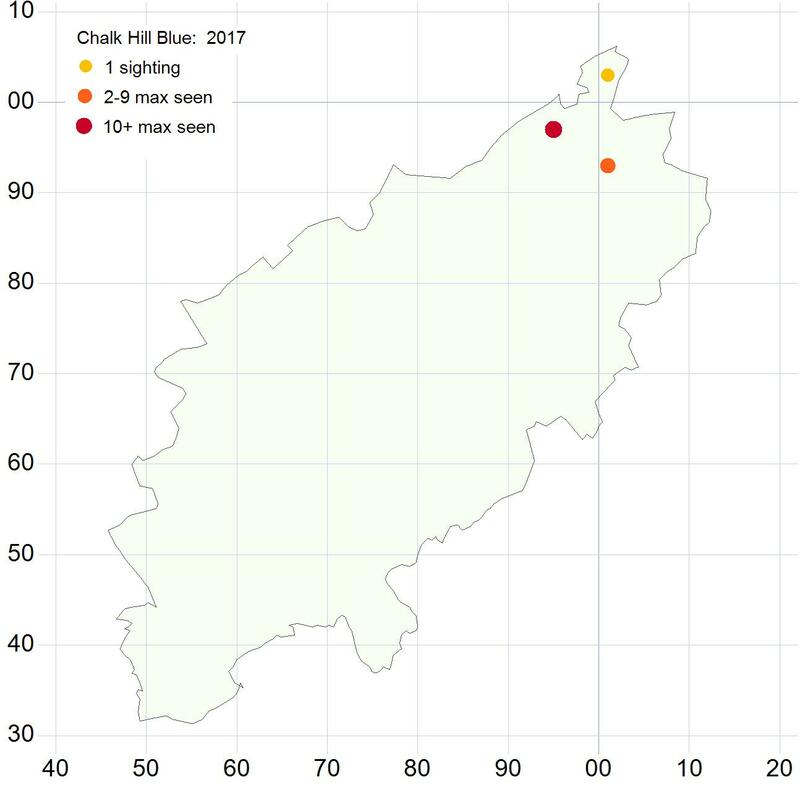 The first Chalkhill Blues of the year were seen on the 17th of July at Spanhoe and the last were the aforementioned ones at Southwick on the 16th of August. The Holly Blue was down 57% in 2017 but with the many peaks and troughs of the species due to the constant threat of parasitoids this is nothing unusual and as 2016 was a good year for them in Northants it comes as no surprise that the numbers were down. Despite this we still had quite a lot of sightings dotted around the county. 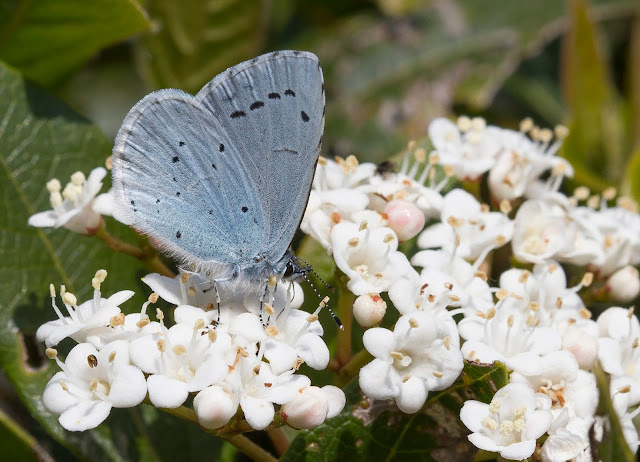 The first Holly Blue of the year was seen on the 15th of March in Burton Latimer and the last was seen on the 31st of August in Barton Seagrave. 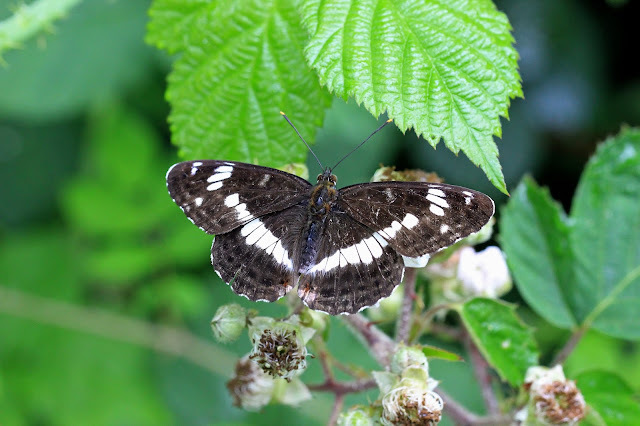 After a couple of relatively poor years for the White Admiral it was very encouraging to see a good increase in records during 2017. The species were up by 143% and we received the largest amount of sightings since 2010. White Admirals were seen in good numbers in Bucknell Wood, Fermyn Wood, Lady Wood, Hazelborough Wood (with a large count of 35 seen on a single visit), Salcey Forest and Whistley Wood and they were seen in less numbers at Fineshade Wood, Glapthorn Cow Pastures, Harry's Park Wood, Lilford Wood, Stoke Albany, Upper Laundimer Wood, Wakerely Wood, Whistley Wood and Yardley Chase. 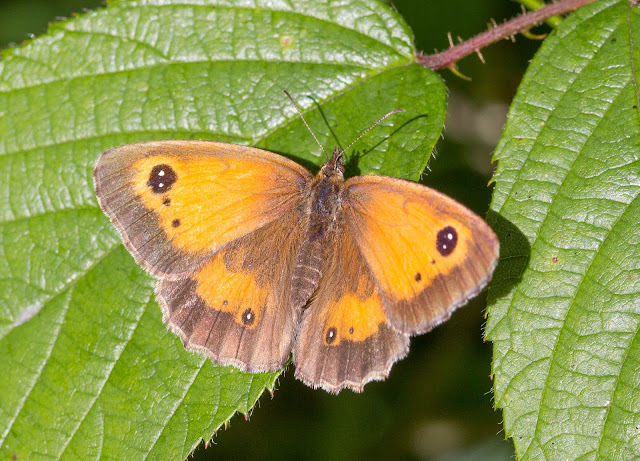 The first of the year was seen on the 14th of June in Fermyn Wood and the last of the year was recorded on the 29th of July in Bucknell Wood. The story of the 2017 Purple Emperor season in Northants is certainly a tale of two halves. What was looking like a good start was abruptly cut short when high winds from the tale end of an Atlantic storm hit the UK just as the species looked to be about to peak. Consequently the records show a 29% decrease from last year. As always Fermyn and Lady Woods were the main sites to see the species but they were also seen in lesser numbers at Brampton Wood, Bucknell Wood, Fineshade Wood, Glapthorn Cow Pastures (the first one for the site), Harry's Park Wood, Horton Woods (private), Monks Arbor Wood, Salcey Forest, Weldon Park Wood, Wicken Wood and Yardley Chase (private). 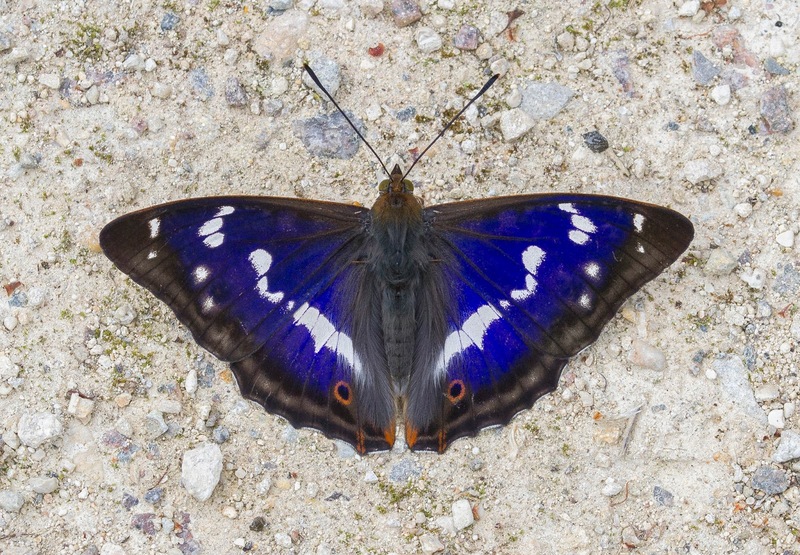 The first of the year was seen on the 17th of June in Lady Wood and the last of the year was seen on the 20th of July in Bucknell Wood. 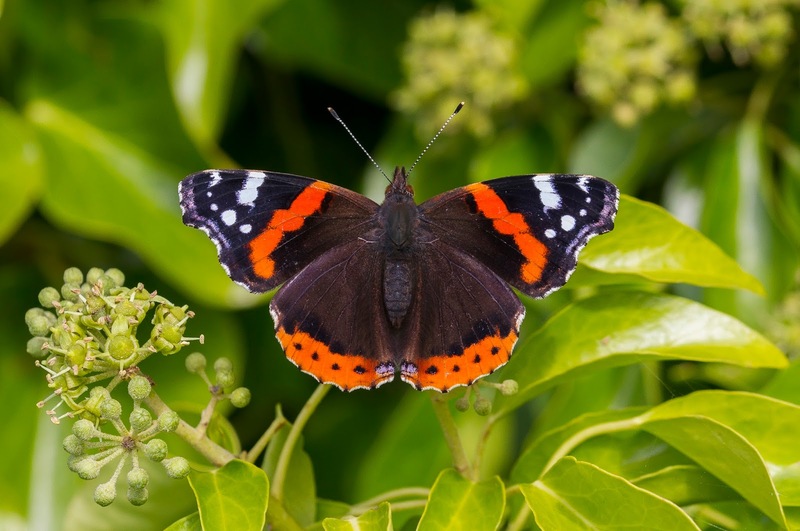 The Red Admiral had a good year and the species were up 97% from the year before. 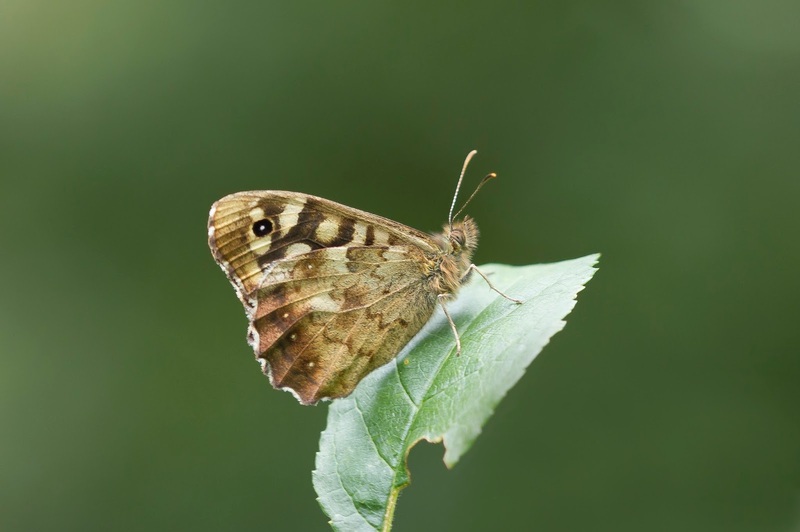 It is one of the few butterflies that can be seen during every month of the year and 2017 was no exception, the first one was seen on the 4th of January along Harborough Road in Northampton and the last one was seen on the 31st December in a Northampton garden. 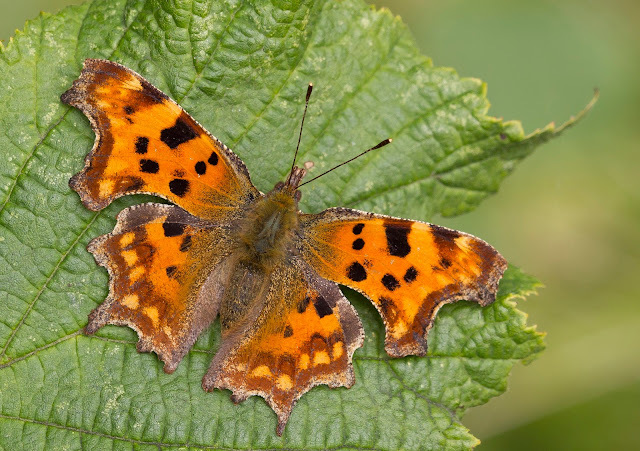 Being a species particularly attracted to Buddleia and other nectar rich plants common in urban environments double figure counts were seen in many gardens throughout the county and rural Brambles and Ivy in the fields and woodlands could be equally productive making this one of the most widely distributed butterflies in the county. The Painted Lady records show a slight increase from the year before although some large counts at individual sites means releases from the popular "rear your own butterfly kits" can't be ruled out. The spread of individual records do seem to show a good migration of the species around the county though. The first one was seen on the 23rd of May at Sywell Country Park and the last for the year was seen on the 24th of September at Ravensthorpe Reservoir. 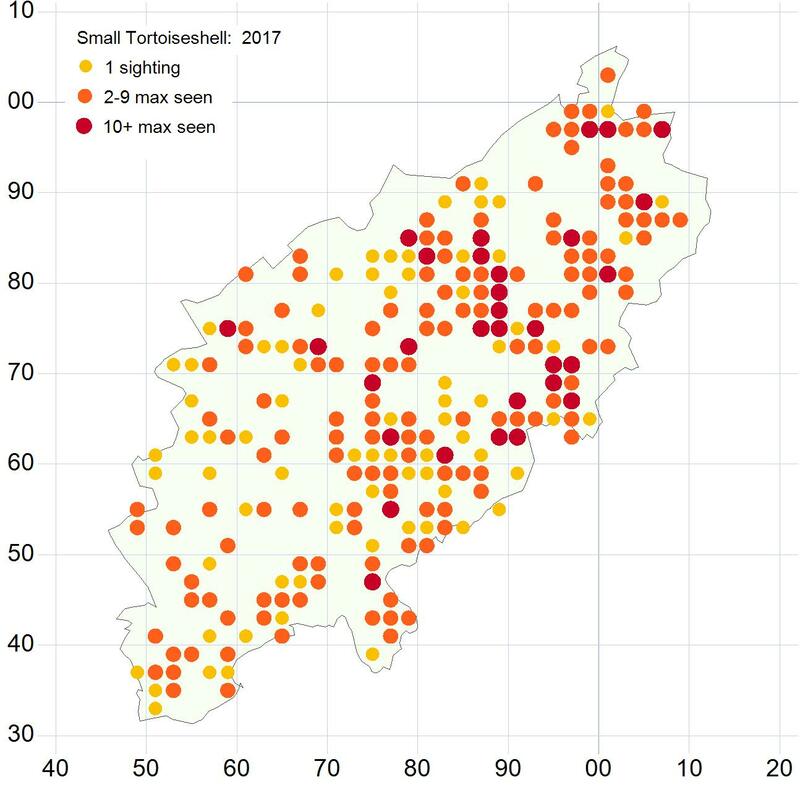 Small Tortoiseshell numbers were up by 55% percent in 2017 and considering the poor years not too long ago this is very nice to see. 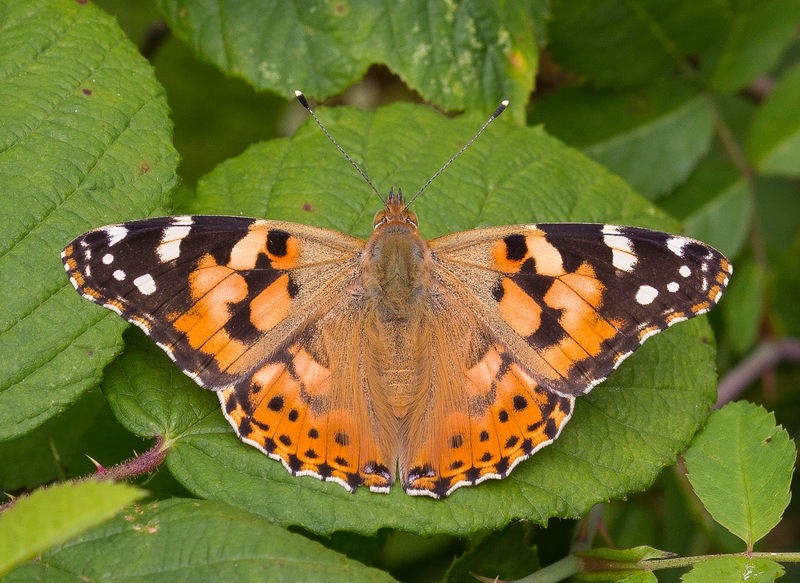 Like the Red Admiral this is a species seen readily in urban as well as rural environments and with the increase in people recording garden butterflies more and more this may have skewed the figures slightly in their favour. Either way they did seem to have a good year in the county and a walk in suitable habitat during their flight times was testimony to this. 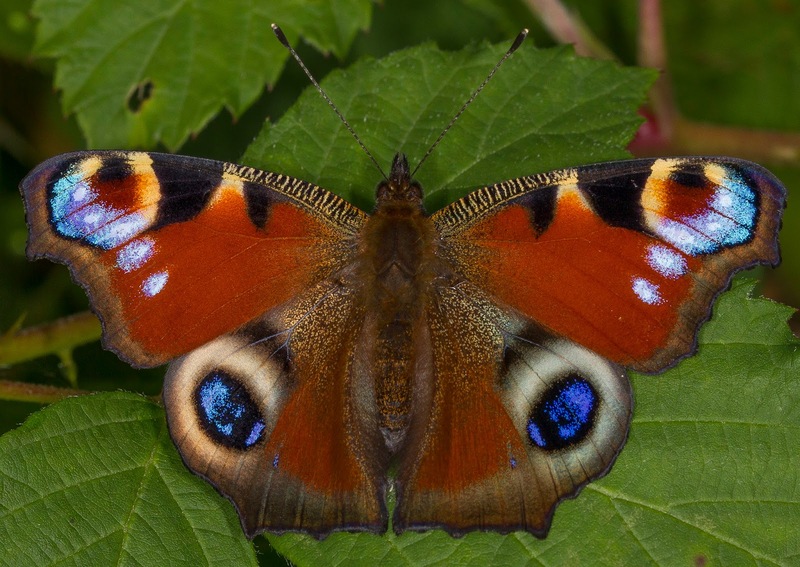 The first of the year was seen on the 8th of January in Northampton and the last was seen on the 17th of November in Thrapston. 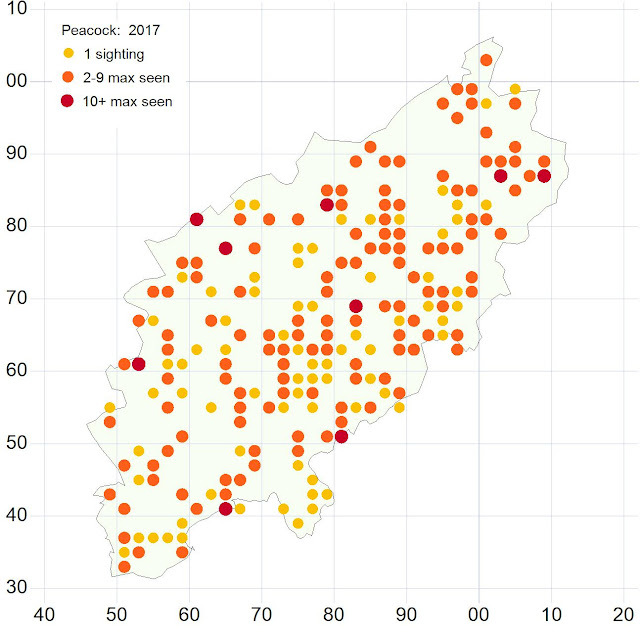 Peacock totals show a slight increase from 2016 with double figure counts coming from multiple urban and rural sites around the county. 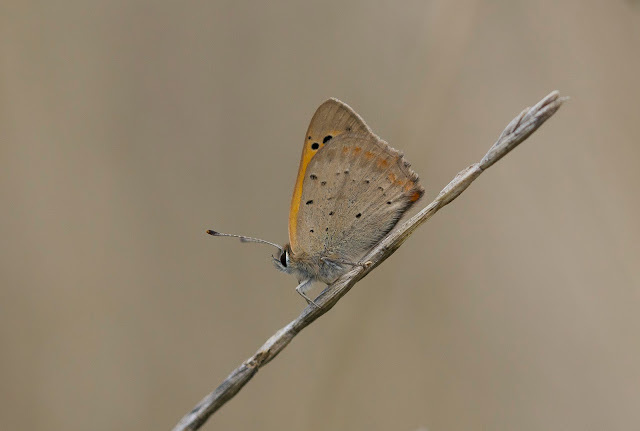 The first of the year was seen on the 11th of January at Stanford Reservoir and the last was seen on the 17th of October in Barton Seagrave. Comma records were 87% up from 2016 and showed some good numbers at some sites. The highest counts came from Bradlaugh Fields on the 13th of March, Fermyn Wood on the 1st of July and Pitsford Reservoir on the 17th of August although a good spread of lower numbers were seen throughout the county. The first of the year was seen on the 9th of March in Northampton and the last on the 28th of October in Sulby Manor gardens. We had a small set of Dark Green Fritillary records sent in during 2017 and although the species isn't present in the county in nowhere near large numbers I do feel them worthy of mentioning. 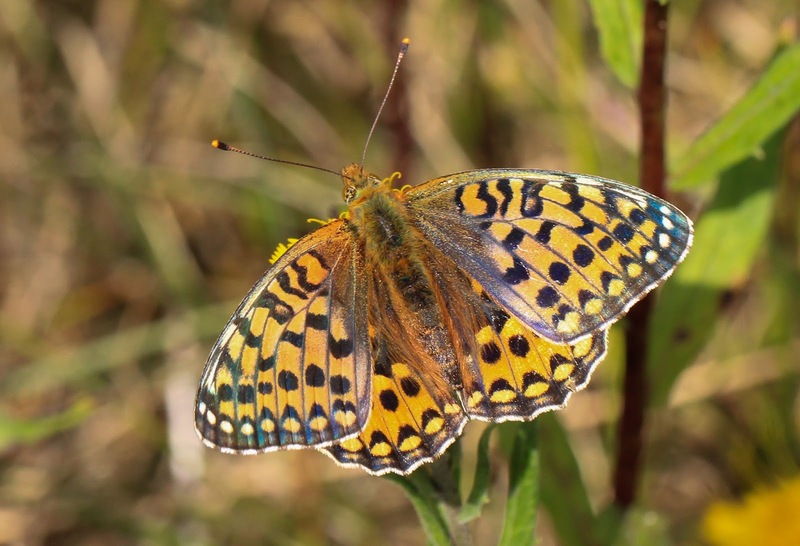 Over the last few years Dark Green Fritillary records have been received from the north eastern part of the county and the regular sightings at Ring Haw (part of the Old Sulehey Reserve) does suggest they are resident there and the species being recorded from the 20th of June to the 31st of July there. 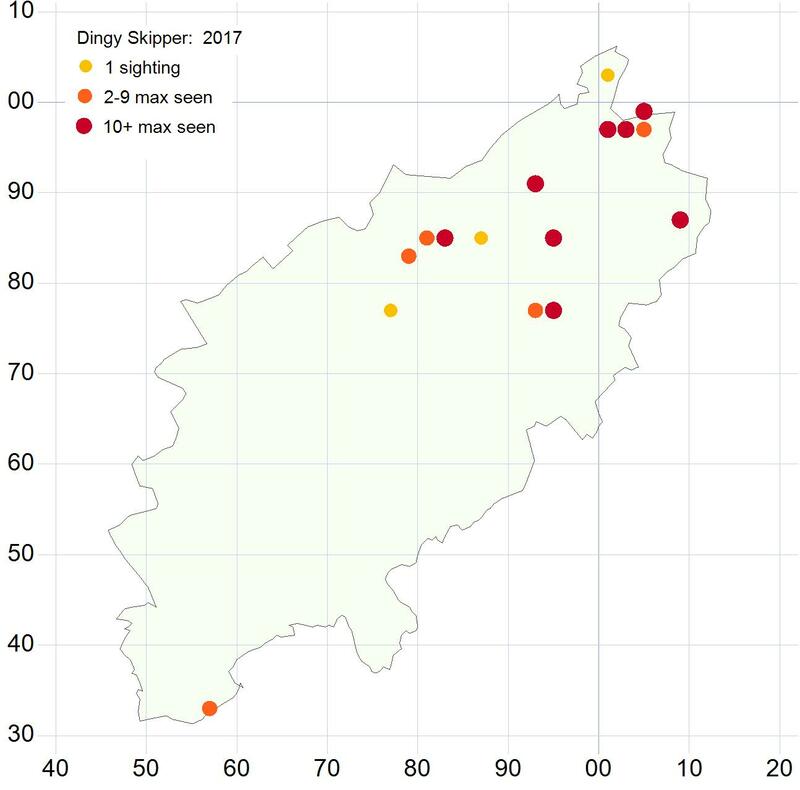 We also received a confirmed sighting from Wakerley Spinney this year with one being seen there on the 20th of June too. 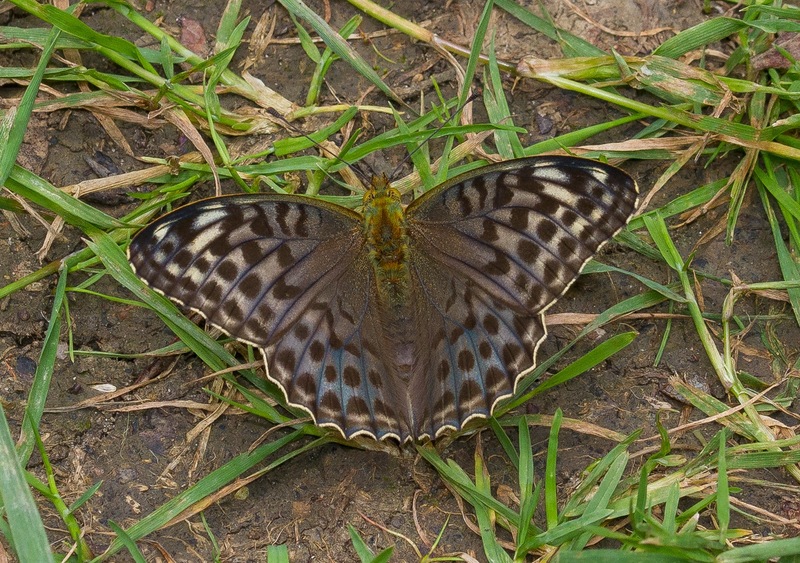 The Fritillaries are notorious for wandering far from their strongholds so some of these records maybe those straying from across the county border, but after the discovery of such a large and previously unknown Chalkhill Blue colony in that area perhaps there is a Dark Green Fritillary colony tucked away up there and waiting to be discovered too! 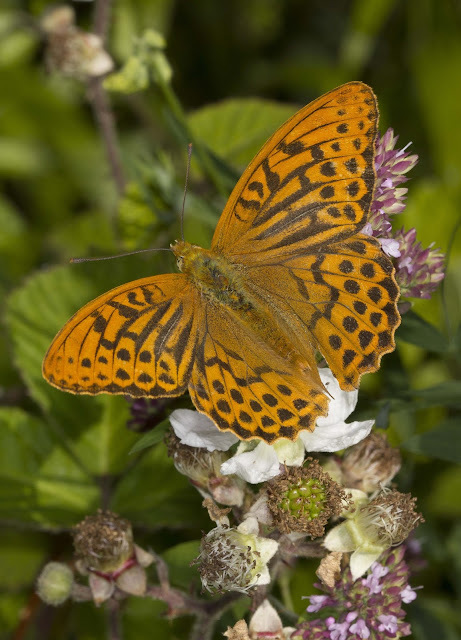 The Silver-washed Fritillary had a fantastic year in the county and the records were up 107% from the year before. The highest counts for the species were 59 in Bucknell Wood and 49 in Hazelborough Forest on the 2nd of July and 40 in Fermyn and Lady Woods on the 13th of July. Double figure counts also came from Ashton Wold, Fineshade Wood, Glapthorn Cow Pastures, Great Morton Sale, Harry's Park Wood, Upper Laundimer Wood, Weekley Hall Wood and Yardley Chase. The Silver-washed Fritillary colour form valezina was also regularly seen with 5 recorded in Fermyn Wood, 4 in Bucknell Wood, 3 in Hazelborough Forest and singles reported in Glapthorn Cow Pastures and Fineshade Wood. 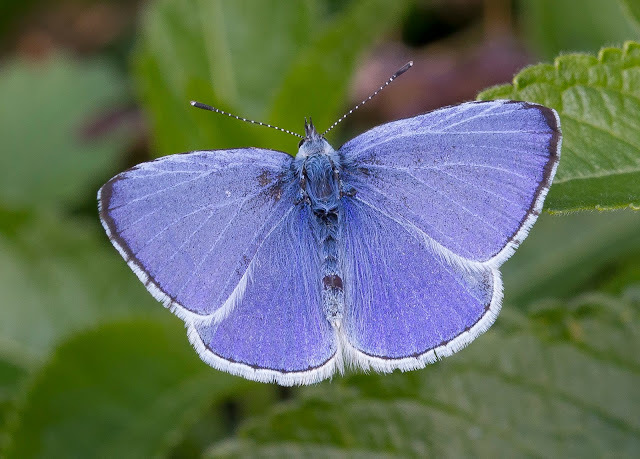 The first of the year was seen on the 16th of June in Glapthorn Cow Pastures and the last of the year was seen on the 28th of August in Bucknell Wood. 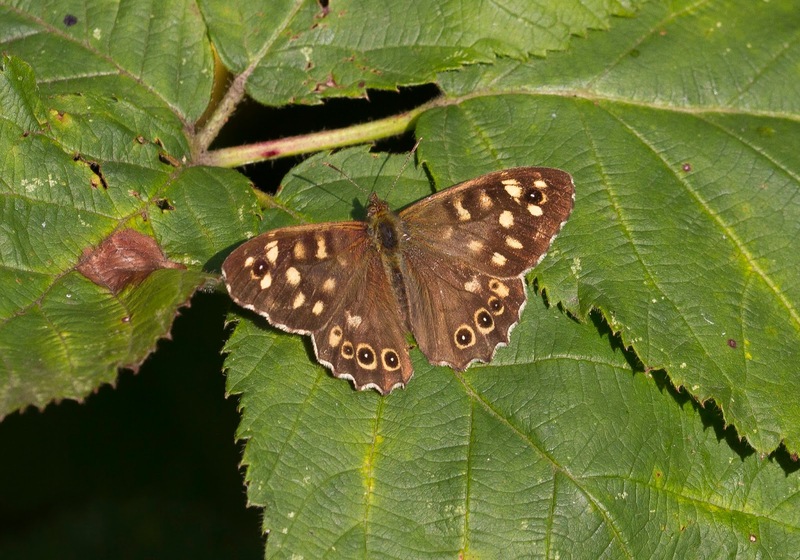 The Speckled Wood showed a slight increase from 2016 with a 10% increase in records. 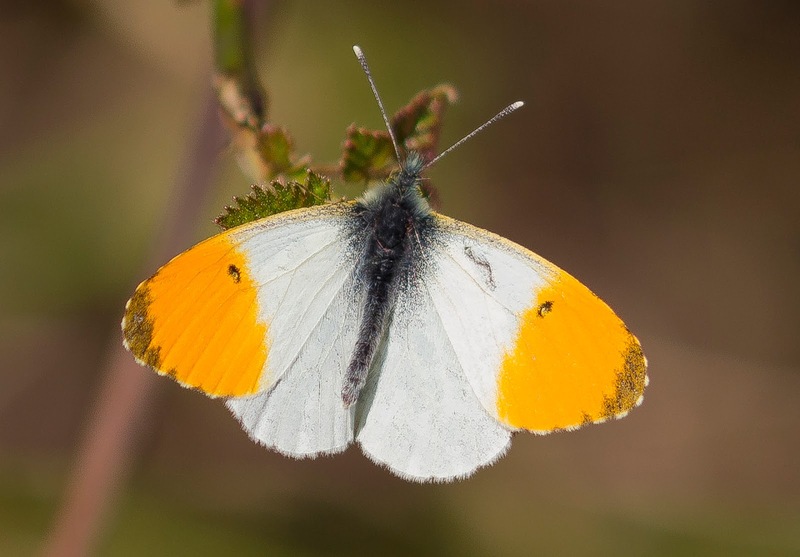 The first of the year was seen on the 1st of April in Bucknell Wood and the last was seen on the 27th of October in Irchester Country Park. 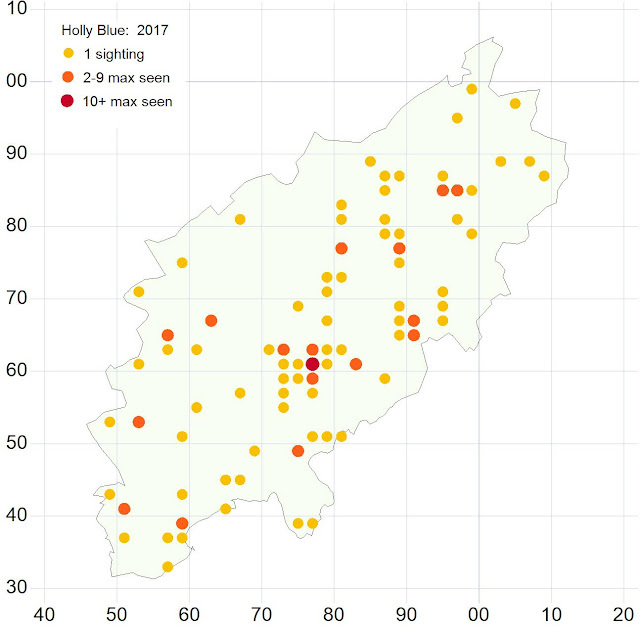 Particularly high counts were noted in Bucknell Wood, Castle Ashby Gardens, Fermyn Wood, Fineshade Wood, Glapthorn Cow Pastures, Hollowell Reservoir, Salcey Forest, Shire Hill Wood, Stanford Reservoir, Sywell Country Park, Wakerley Woods and Yardley Chase. 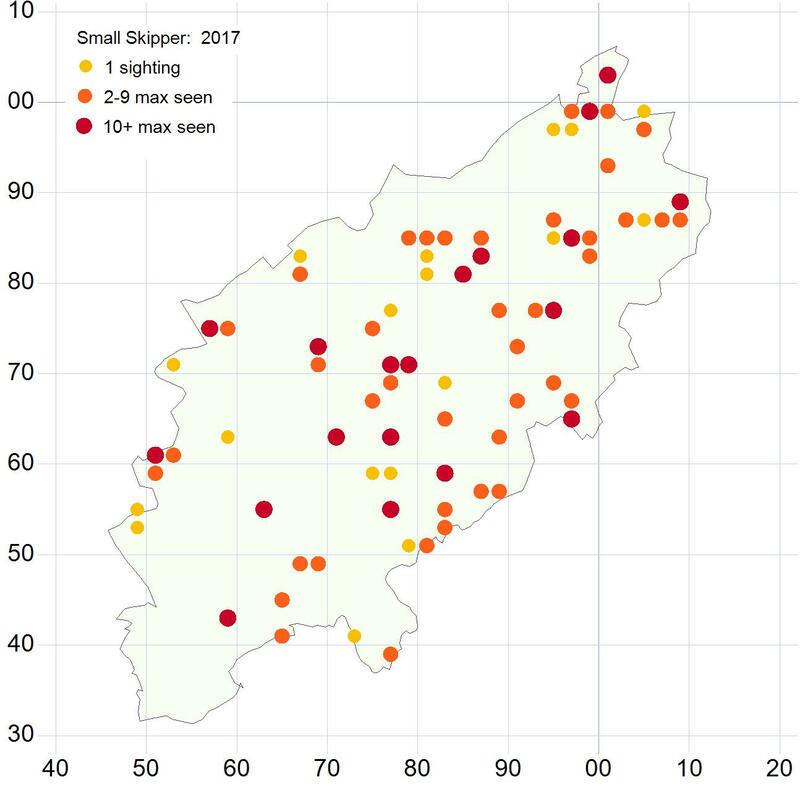 After the rapid expansion of this species in the county over the last few years at some point the species was always going to have a "blip" year and 2017 appeared to be that time. Although the species suffered from blustery conditions in the summer during their flight time their numbers were only slightly down by 8% from the year before. By far the highest recorded figure came from Bradlaugh Fields when a large count of 345 were recorded in one day on the 1st of July and most of our other grassland sites held the species in double figures. 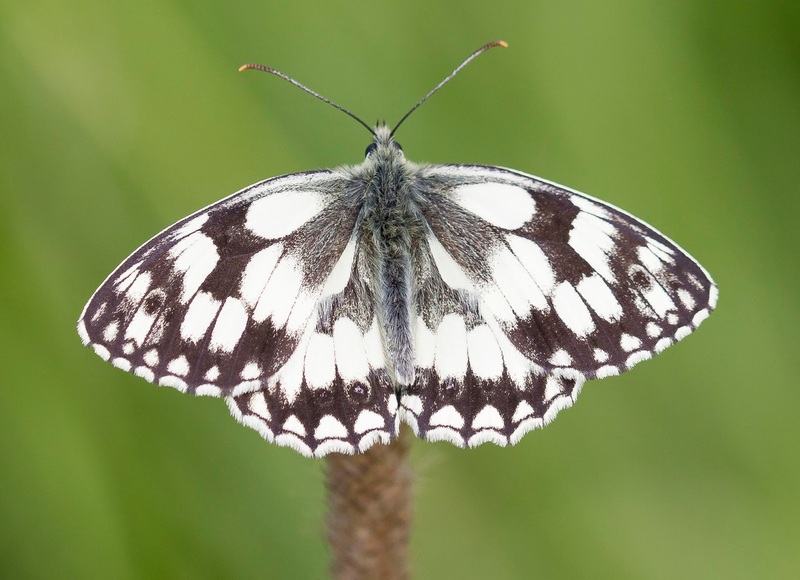 The first of the year was seen on the 13th of June along the edge of the New Duston estate in Northampton and the last one was recorded on the 7th of August near Earls Barton. 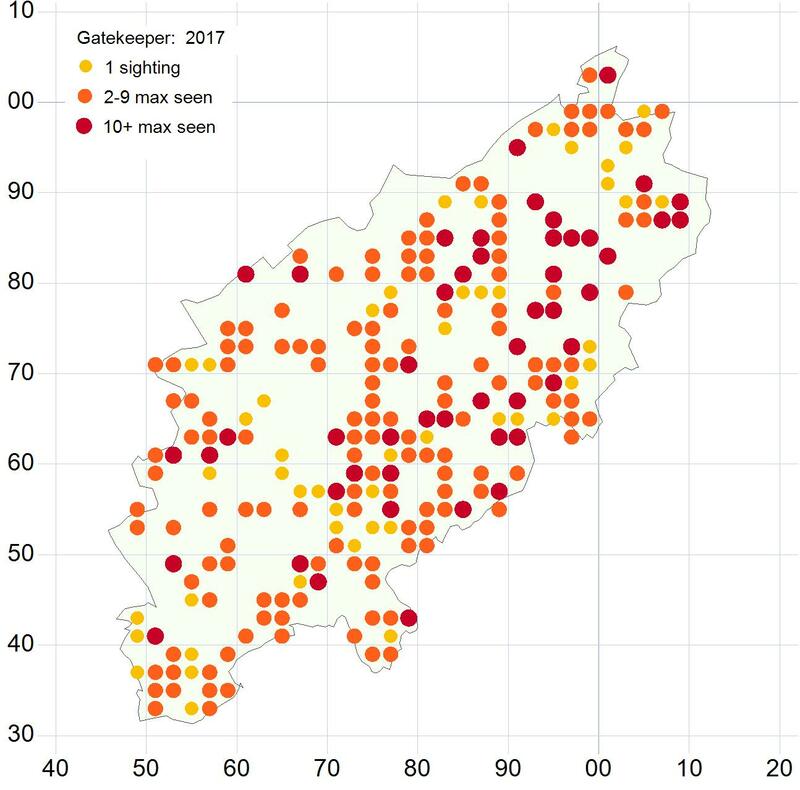 The Gatekeeper saw a 64% rise in records during 2017 with the highest counts coming from Bradlaugh Fields, Collyweston Deeps, Cosgrove, Easton Maudit, Fermyn and Lady Wood, Lyvedon New Bield, Polebrook Airfield, Towcester, Grange Park in Northampton, Weekley Hall Wood, the Embankment in Wellingborough, and Twywell Hills and Dales. 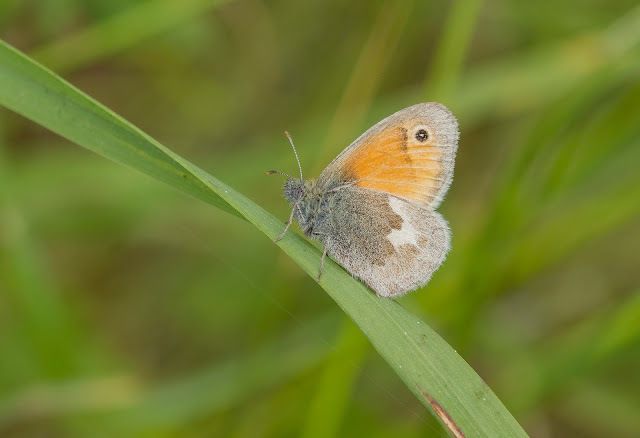 The first of the year was seen on the 18th of June in Wellingborough and the last for the year was seen on the 11th of September in Draughton Crossing Meadow. 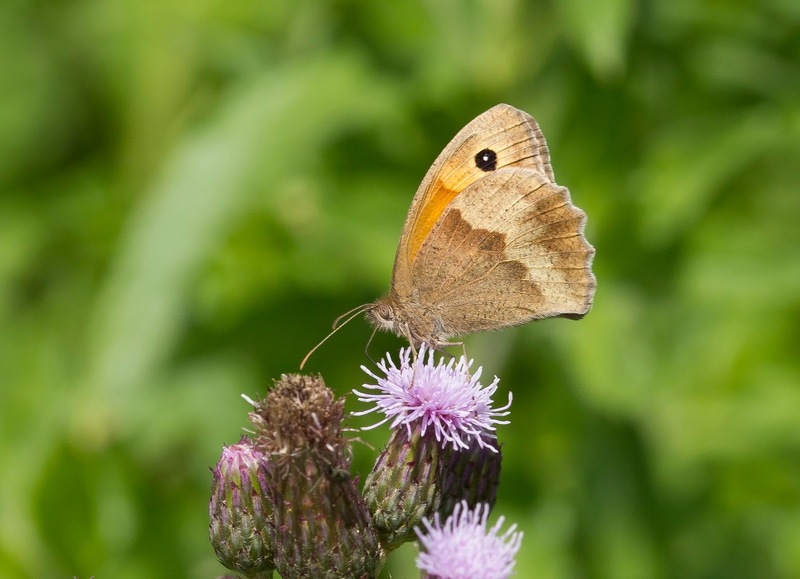 The Meadow Brown was the most recorded butterfly in the county during 2017 and the records show an increase of 39% from 2016. They were seen in all the main grassland sites but the largest counts came from Ashton Wold, Bradlaugh Fields, Lyvedon New Bield, Ring Haw and Weekley. The first was seen on the 1st of June in Wellingborough and the last was seen on the 22nd of September at Ring Haw. 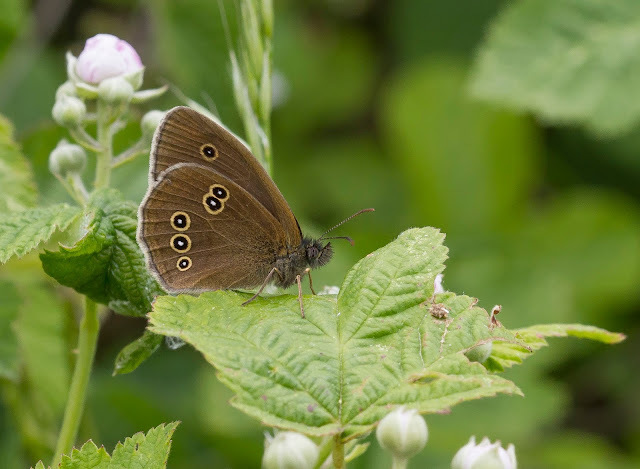 The Ringlet certainly didn't have a very good year in Northants and the records show a large decrease of 73%. 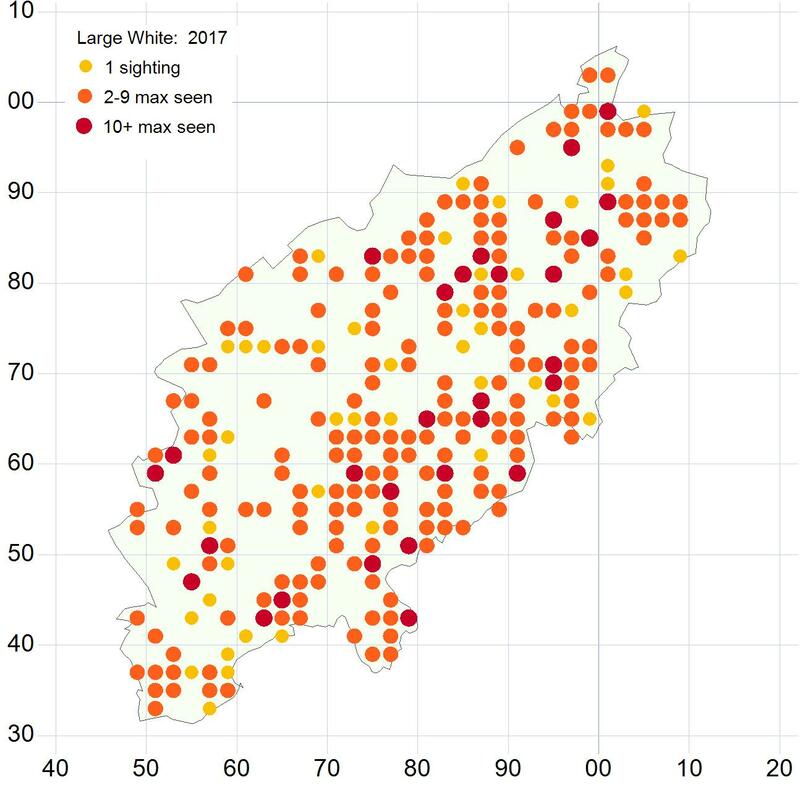 Despite them being present in most of the suitable habitats they had the poorest year since 2008. The first of the year was recorded on the 11th of June at Pitsford Water and the last one was seen on the 27th of August in East Haddon. 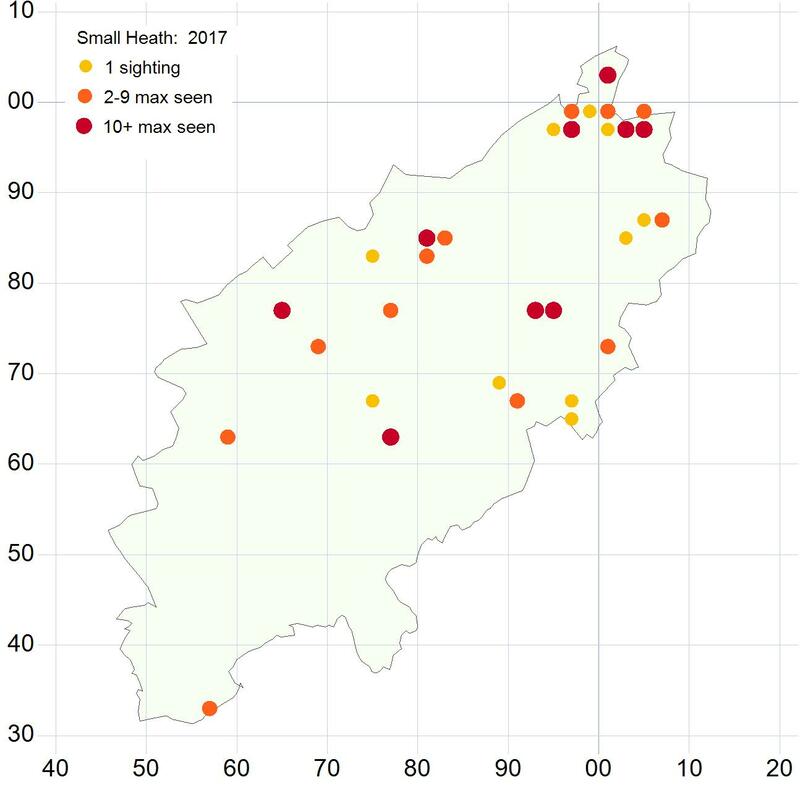 The Small Heath had a fantastic year and with one of the highest counts of the species for the county on record they were up from 2016 by 219%. Key sites for the species were Bradlaugh Fields, Collyweston Deeps, Great Morton Sale, Ring Haw, Twywell Hills and Dales and Welford Quarry. Twywell Hills and Dales produced both the firsts and the lasts of the year with the first one recorded on the 5th of May and the last one seen on the 5th of October. I did receive a couple of interesting records during 2017 which are no doubt due to accidental releases or escapees from rearing. 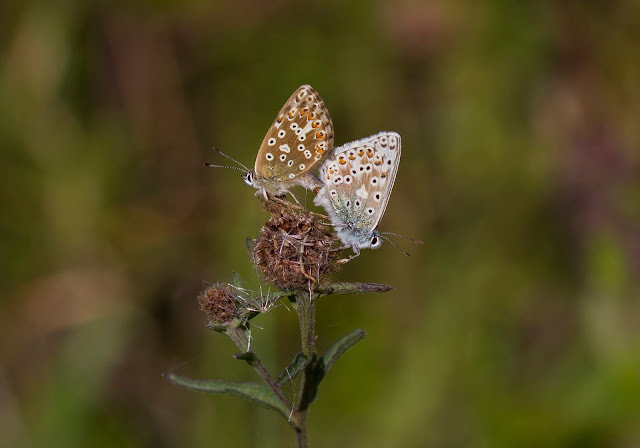 The first was a Monarch which was seen twice in Brixworth during early July and the other was a Long-tailed Blue seen and photographed in a Clipston garden on the 22nd of September. 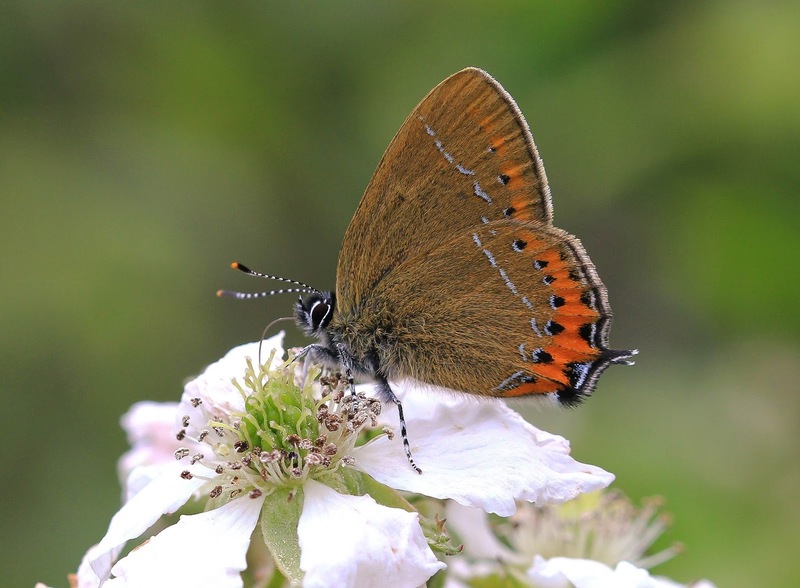 Another unusual record was a Brown Hairstreak reported at Jack's Green on the 27th of July. 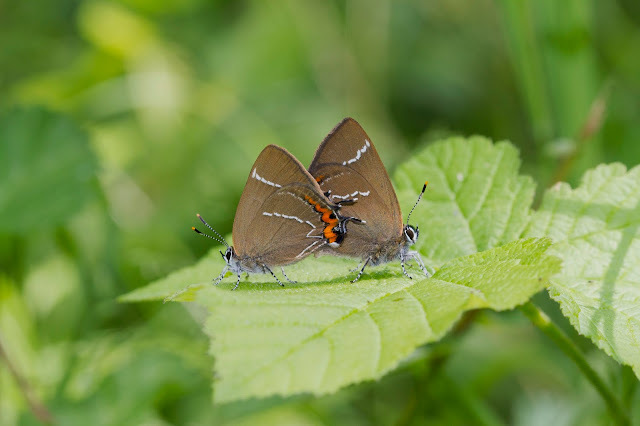 This seemed a bit more plausible as a genuine record so soon after Doug Goddard and I had a look and although we couldn't confirm the presence of any Brown Hairstreaks we did find lots of very suitable habitat so who knows, perhaps there's a secret colony of these tucked away somewhere in the county too! 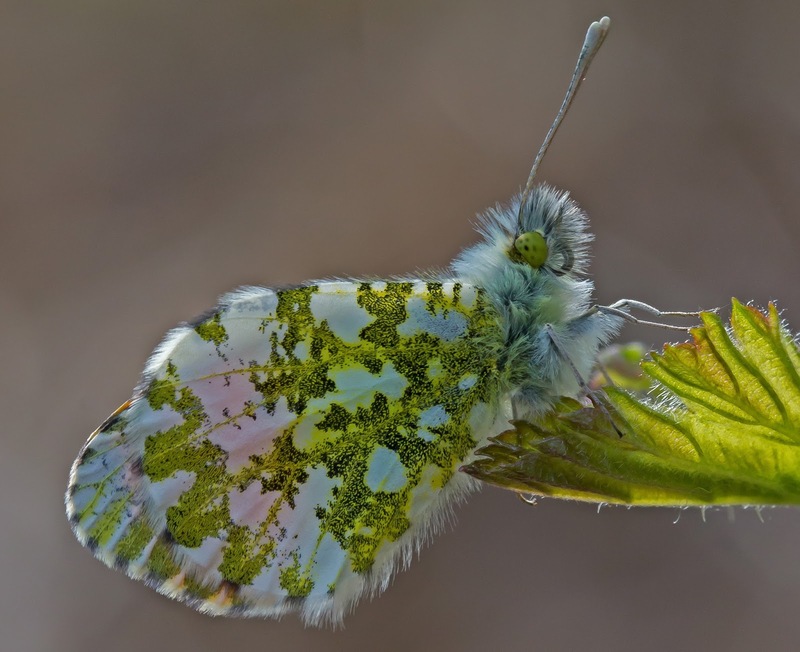 Camera Drones Are A New Way To See Butterflies UAV’s can be utilized in a selection of research that calls for the aerial collection of statistics along with archeological studies, glacier surveillance, ocean and sea research help, mapping coastal areas, radiation or iceberg monitoring, measuring nuclear infection, analyzing biodiversity or shooting the unfold of larvae.